Washington (CNN) -- Tim Murphy was fascinated with trains at the age of 9. Every morning and evening, he went outside to watch an iron horse roar by on the railroad line that cut through Northfield, Ohio. He placed pennies on the tracks. He waved at the engineer and watched the caboose disappear into the distance. But one time, the train didn't come. A patient from the nearby state psychiatric hospital had escaped and laid down on the tracks. Murphy didn't see the body, but news of the suicide hit hard. He calls it his "first encounter" with mental illness. "It was frightening to me, and I didn't quite know how to comprehend this. But I remember being very shook up for a number of days." Now Murphy is a psychologist -- the only one serving in Congress. And as the nation marks the second anniversary of the school massacre in Newtown, Connecticut, the representative from Pennsylvania is shook up. The mantle he accepted and embraced in the aftermath of Newtown haunts him: to fundamentally change America's mental health system. "It's two years and nothing's happened. Period," says Neil Heslin, whose 6-year-old boy, Jesse, was killed that day. "It is what it is." Murphy met with Newtown families whose children were killed in the massacre and pledged to dedicate his career to fixing a broken system. As a reminder, he keeps photographs of the children on a table in his office. He traversed the nation, holding dozens of public forums on mental illness and meeting with hundreds of families affected by a system that too often fails their mentally ill children. The Republican congressman held multiple hearings looking into the state of the nation's mental health care system. Even with his years of training, Murphy still gets taken aback when he hears stories from families. He marvels at the love of traumatized parents and ponders tough questions: Why has mental health care abandoned those it is meant to help the most? What emerged from his work was legislation that seeks to make the most sweeping change in the system in more than two decades. But it's almost as though Murphy's Law got in the way of Murphy's law: Everything that could go wrong did. A Democratic bill introduced this spring scuttled bipartisanship and undercut his hard work. House leaders raised budgetary concerns. International crises in Iraq and Syria diverted attention over the summer. And a fickle public moved on. 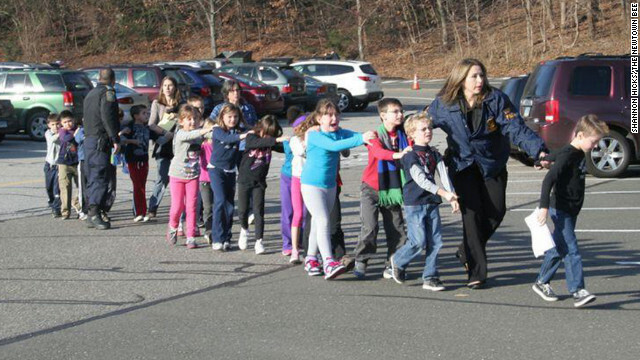 Police evacuate children from Sandy Hook Elementary School in Newton in 2012. While some lawmakers focused on gun laws after Newtown, including Sen. Chris Murphy of Connecticut, this Murphy was emphatic about what drove Adam Lanza to kill 26 people, including 20 children inside Sandy Hook Elementary School. In a closed-door meeting -- what he called Psychology 101 -- with House Republicans two years ago, he told fellow lawmakers to stop turning a blind eye to mental illness. "I see it as the center of the issue," he said. "Get mental illness out of the shadows." 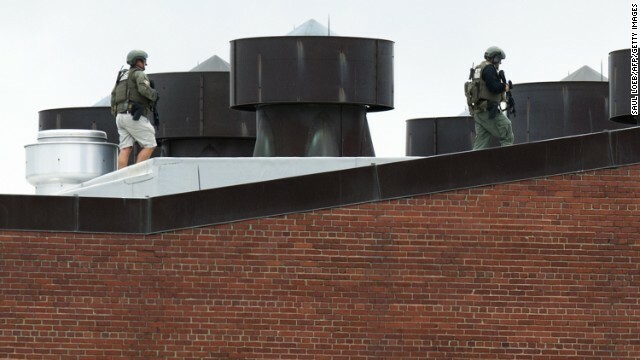 Police officers walk on a rooftop at the Washington Navy Yard on Monday, September 16, after a shooting rampage in the nation's capital. At least 12 people and suspect Aaron Alexis were killed, according to authorities. 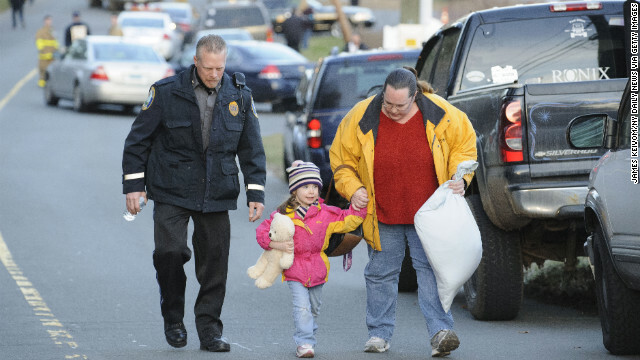 Connecticut State Police evacuate children from Sandy Hook Elementary School in Newtown, Connecticut, on December 14, 2012. 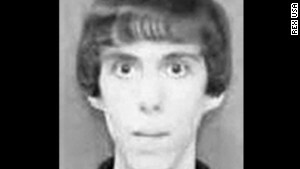 Adam Lanza opened fire in the school, killing 20 children and six adults before killing himself. Police say he also shot and killed his mother in her Newtown home. 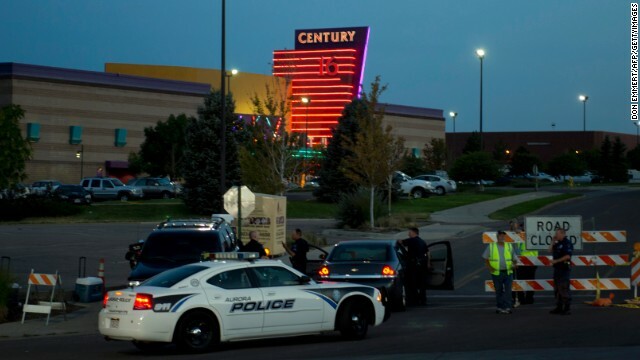 James Holmes pleaded not guilty by reason of insanity to opening fire July 20, 2012, at the Century Aurora 16 theater in Aurora, Colorado, during the midnight premiere of "The Dark Knight Rises." Twelve people were killed and dozens were wounded. Holmes is charged with 142 counts, including first-degree murder. His trial is scheduled to begin in February 2014. 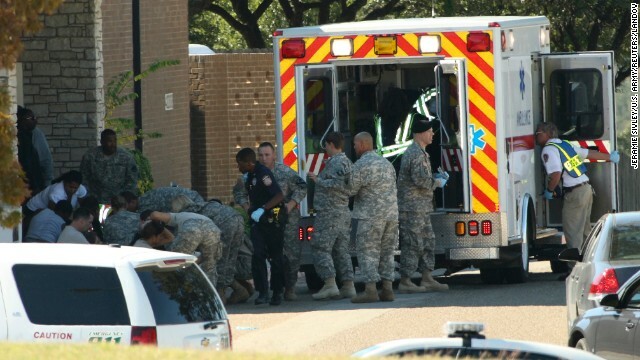 A military jury convicted Army Maj. Nidal Hasan on Friday, August 23, 2013, of 13 counts of premeditated murder in a shooting rampage at Fort Hood, Texas. 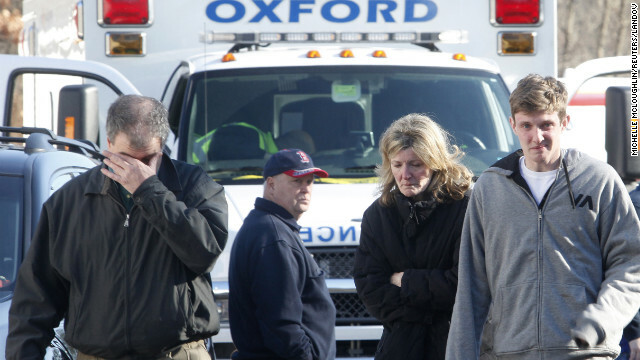 During the November 5, 2009 shooting, 13 people died and 32 were injured. 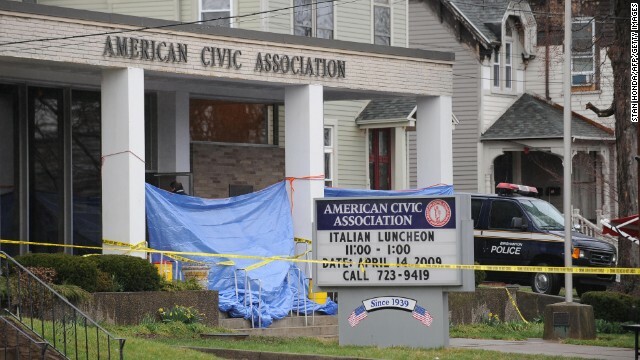 Jiverly Wong shot and killed 13 people at the American Civic Association in Binghamton, New York, before turning the gun on himself on April 3, 2009, police say. Four other people were injured at the immigration center shooting. Wong had been taking English classes at the center. Pallbearers carry a casket of one of Michael McLendon's 10 victims. McLendon shot and killed his mother in her Kingston, Alabama, home, before shooting his aunt, uncle, grandparents and five more people. He shot and killed himself in Samson, Alabama, on March 10, 2009. McClendon left a note saying he put his mother "out of her misery." 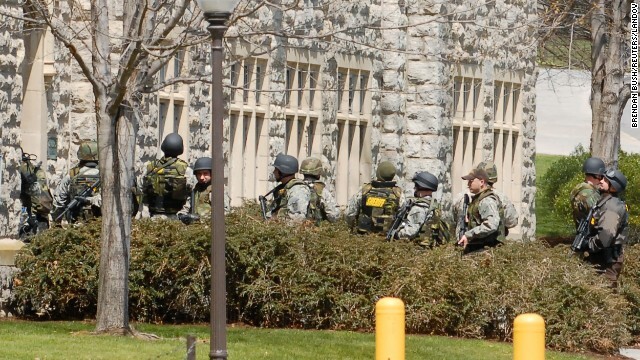 Virginia Tech student Seung-Hui Cho went on a shooting spree on the campus in Blacksburg, Virginia, on April 16, 2007. Cho killed two people at the West Ambler Johnston dormitory and, after chaining the doors closed, killed another 30 at Norris Hall, home to the Engineering Science and Mechanics Department. He wounded 17 people before killing himself. 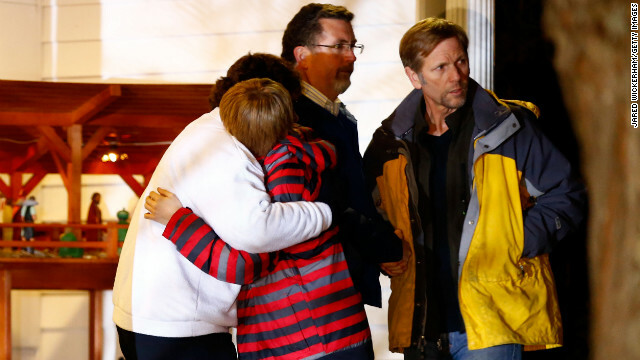 It is the deadliest shooting rampage in U.S. history. 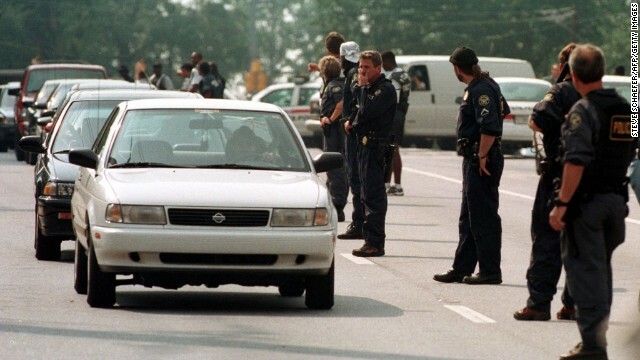 Mark Barton walked into two Atlanta trading firms on July 29, 1999, and fired shots, leaving nine dead and 13 wounded, police say. Hours later police found Barton at a gas station in Acworth, Georgia, where he pulled a gun and killed himself. The day before Barton had bludgeoned his wife and his two children in their Stockbridge, Georgia, apartment, police say. 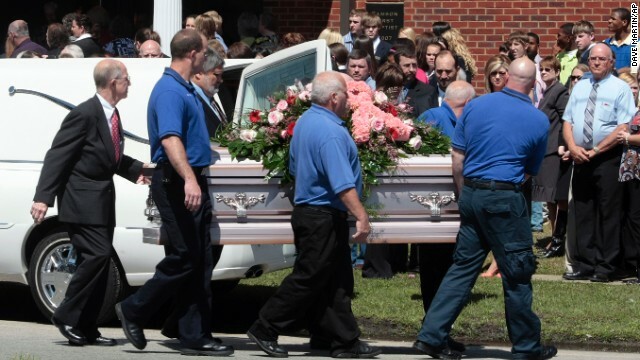 The children's birth mother and grandmother had been murdered six years earlier in Alabama. Barton was questioned but never charged in that crime. 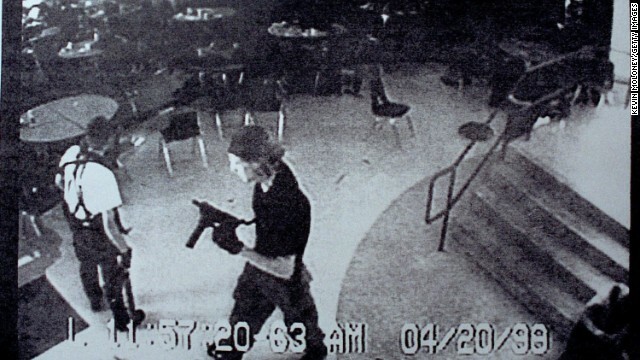 Eric Harris, left, and Dylan Klebold entered Columbine High School in Littleton, Colorado, on April 20, 1999, armed with bombs and guns. The students killed 13 and wounded 23 before killing themselves. 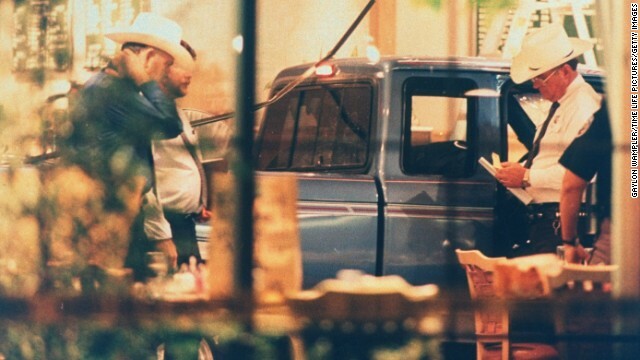 George Hennard crashed his pickup through the plate glass window of Luby's Cafeteria in Killeen, Texas, on October 16, 1991, before fatally shooting 23 people and committing suicide. 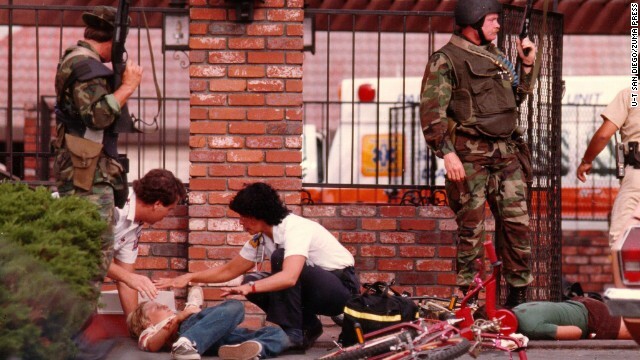 James Huberty shot and killed 21 people, including children, at a McDonald's in San Ysidro, California, on July 18, 1984. 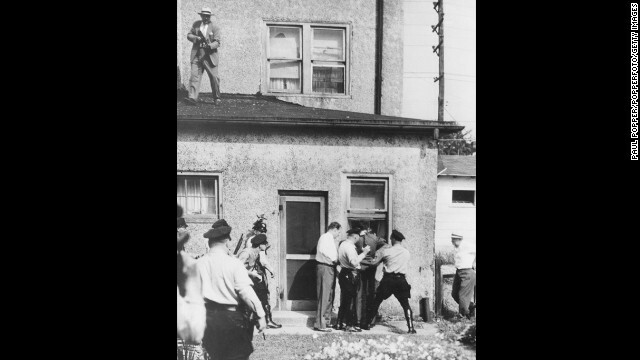 A police sharpshooter killed Huberty an hour after the rampage began. Prison guard George Banks is led through the Luzerne County courthouse in 1985. 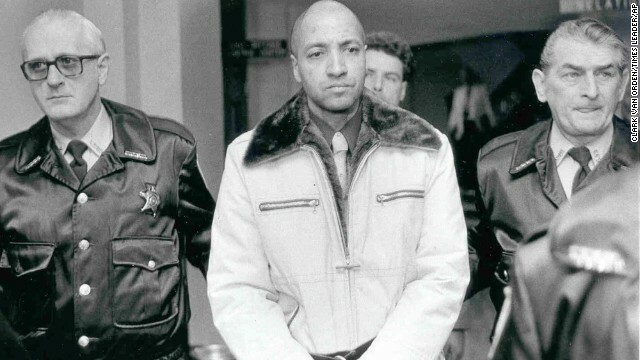 Banks killed 13 people, including five of his children, in Wilkes-Barre, Pennsylvania, on September 25, 1982. He was sentenced to death in 1993 and received a stay of execution in 2004. His death sentence was overturned in 2010. 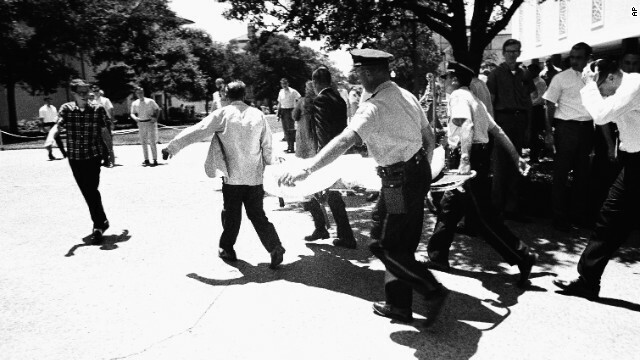 Officers carry victims across the University of Texas at Austin campus after Charles Joseph Whitman opened fire from the school's tower, killing 16 people and wounding 30. Police officers shot and killed Whitman, who had killed his mother and wife earlier in the day. Howard Unruh, a World War II veteran, shot and killed 13 of his neighbors on September 5, 1949, In Camden, New Jersey. 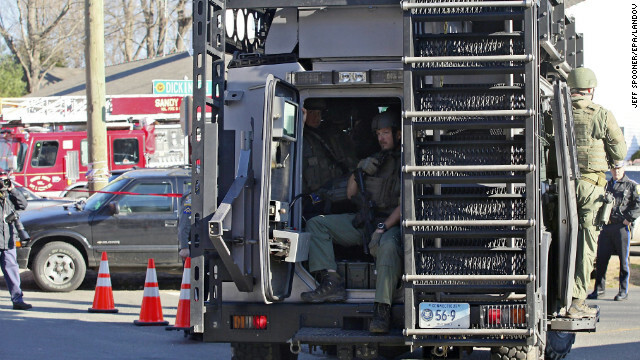 Unruh barricaded himself in his house after the shooting. Police overpowered him the next day. He was ruled criminally insane and committed to a state mental institution. Worst mass shootings in U.S. Photos: Worst mass shootings in U.S.
On an appearance on CBS's "Face The Nation," the congressman blasted those who blamed violent video games as the genesis for the shooting spree. "We're chasing the wrong rabbit down the wrong hole," Murphy said. "We need to be addressing mental illness, and we're not." 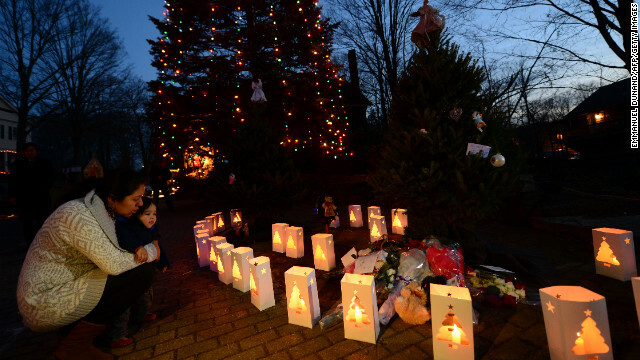 Candles burn next to a lighted tree at a makeshift shrine in Newtown, Connecticut, commemorating the victims of the mass shooting at Sandy Hook Elementary School on December 14, 2012. 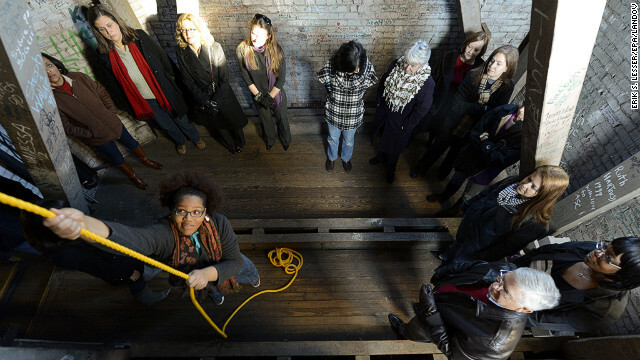 Erica Simmons rings the campus bell at Agnes Scott College in Decatur, Georgia, during a nationwide commemoration December 21, marking a week since the Newtown, Connecticut, mass shooting. 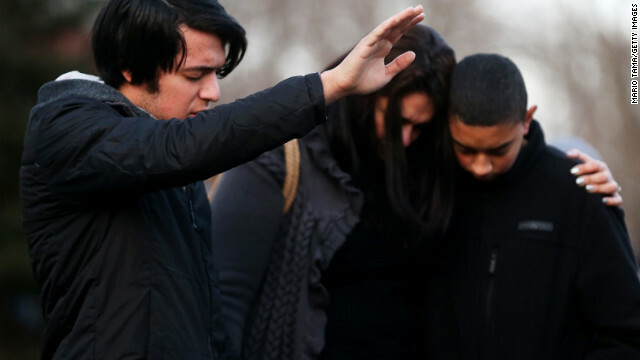 Church bells rang out across the country at 9:30 ET Friday to remember those who died in the gun rampage. 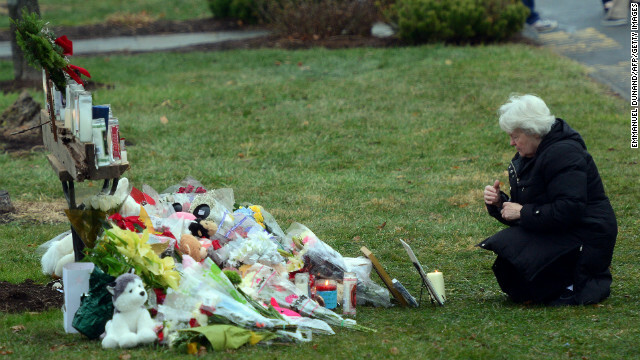 A woman pauses at a streetside memorial during a moment of silence on December 21 in Newtown. 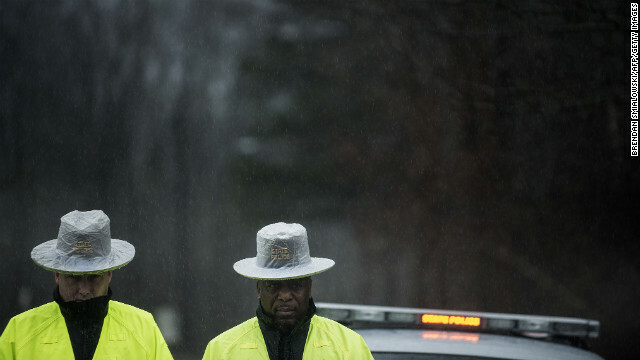 Connecticut State Police block the road to Sandy Hook Elementary School during a moment of silence on December 21. A week ago, a gunman forced his way into the school and shot and killed 26 people, including 20 children. 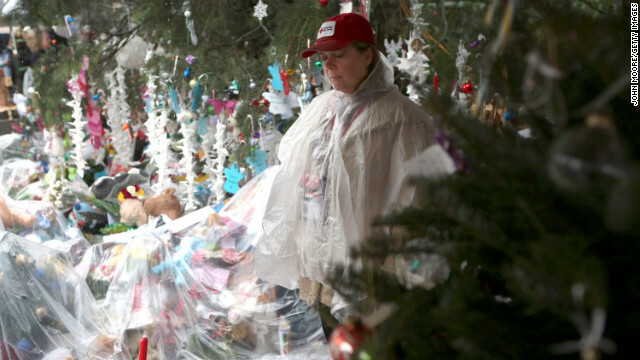 A woman bows her head in Newtown's Sandy Hook village on December 21. 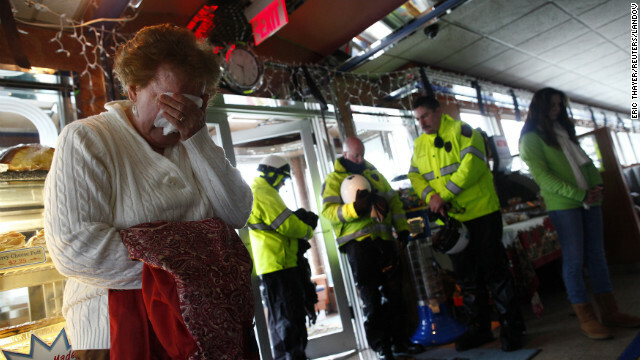 People observe a moment of silence for the school shooting victims at the Blue Colony Diner in Newtown on December 21. 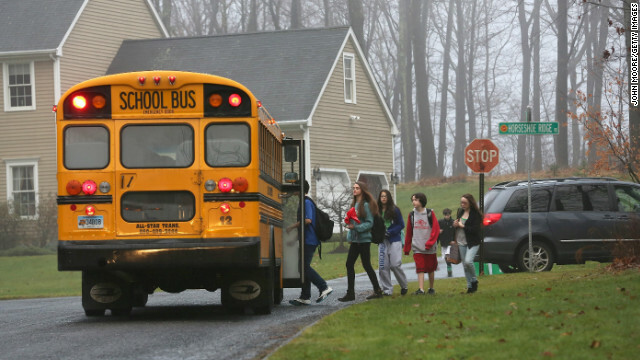 Children in Newtown, excluding Sandy Hook Elementary, return to classes on Tuesday, December 18, four days after the shooting at the elementary school. U.S. Rep. David Cicilline, D-Rhode Island, holds a news conference with the Brady Campaign to discuss gun violence. In attendance with the Brady Campaign were several survivors of gun violence and family members of victims of gun violence. 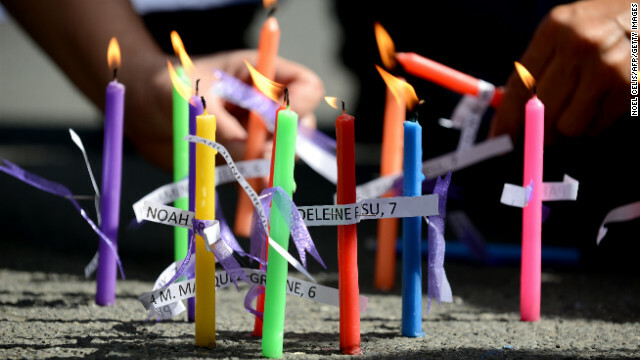 Members of the human rights group Volunteers Against Crime and Corruption light candles showing the names of those killed during the shooting at Sandy Hook Elementary School, during a prayer vigil in front of the U.S. Embassy in Manila, Philippines on December 18. 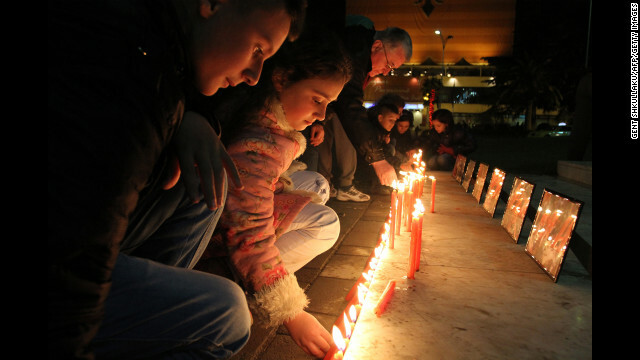 Children light candles to pay their respects to the victims of the Newtown, Connecticut, shooting at the main square in Tirana, Albania, on Monday, December 17. 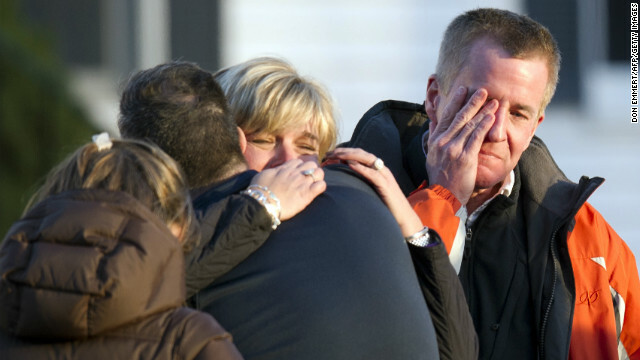 The deadly gun rampage at Sandy Hook Elementary School has provoked strong reactions from around the world. 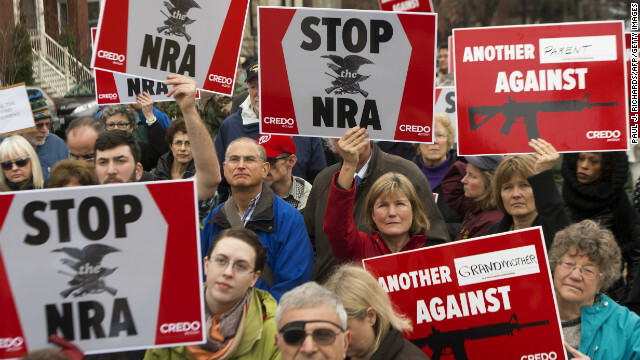 Protesters march on the National Rifle Association's Capitol Hill lobbyist offices in Washington on December 17. New York Mayor Michael Bloomberg speaks out for stronger gun control at a press conference at City Hall on December 17. 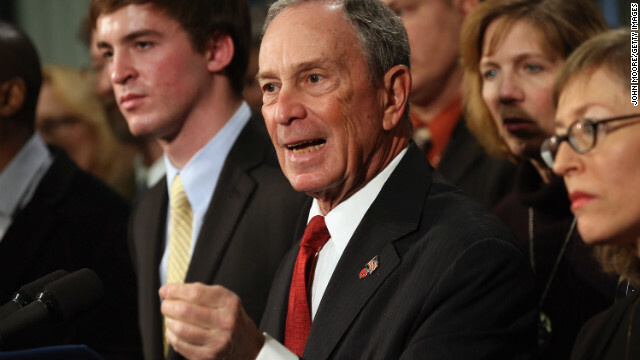 Bloomberg, co-chair of Mayors Against Illegal Guns, was joined by victims and survivors of gun violence. 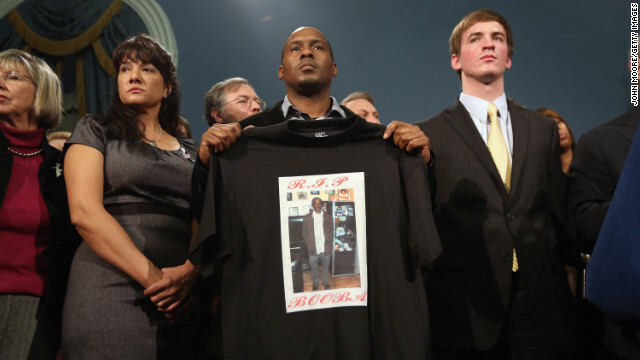 Chris Foye, whose son Chris Owens was killed by a stray bullet in 2009, stands with other survivors and family members of gun violence at Bloomberg's press conference on December 17 in New York. 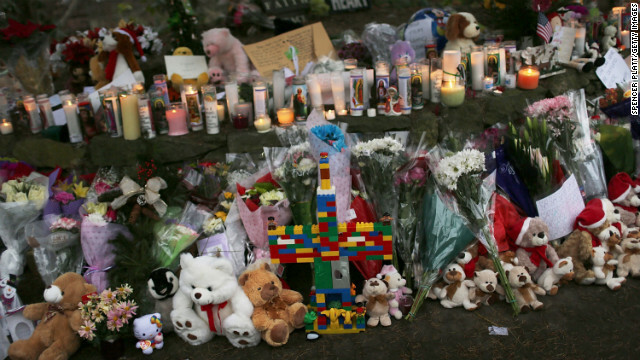 People pay their respects on December 17 at a makeshift shrine in Newtown to the victims of Friday's elementary school shooting. 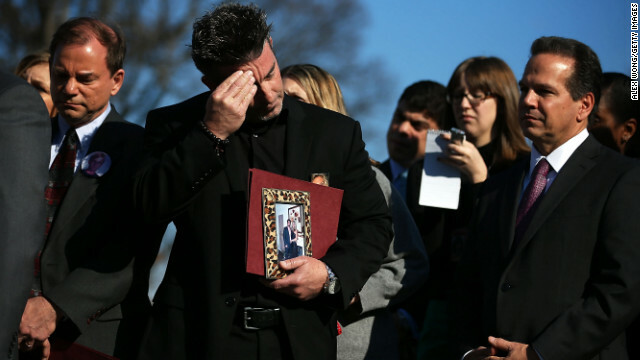 Funerals began Monday in the Connecticut town. 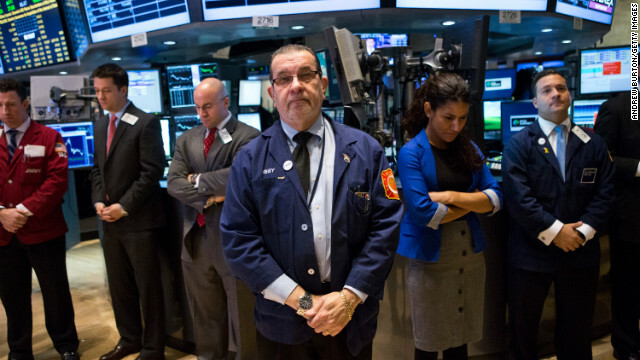 Traders on the floor of the New York Stock Exchange hold a moment of silence on December 17 in honor of the shooting victims. 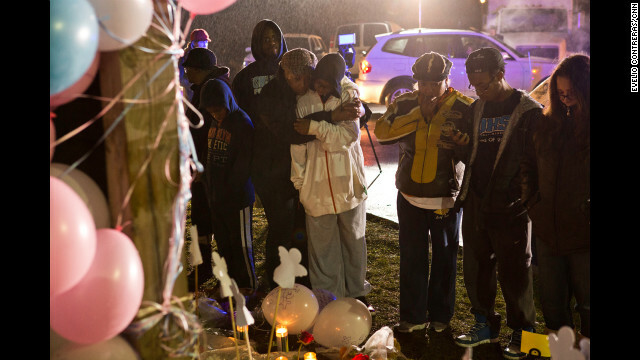 Young people mourn at Newtown High School before a memorial service attended by President Obama on Sunday, December 16. 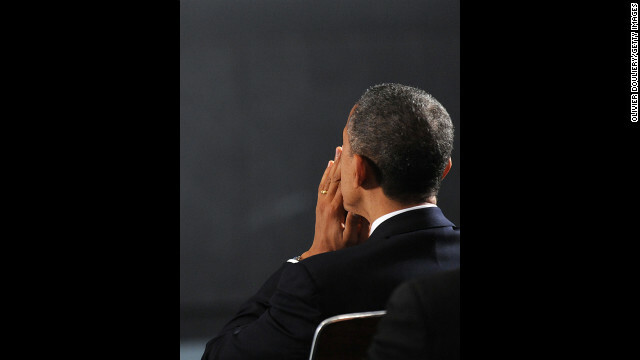 President Barack Obama waits to speak at an interfaith vigil for the shooting victims from Sandy Hook Elementary School December 16 at Newtown High School. 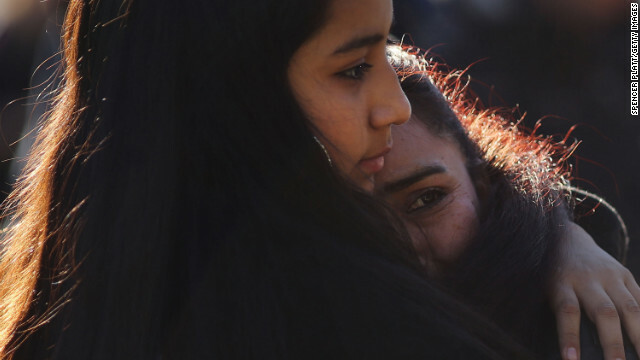 Mourners comfort one another December 16 before U.S. President Barack Obama speaks at an interfaith vigil for the shooting victims. 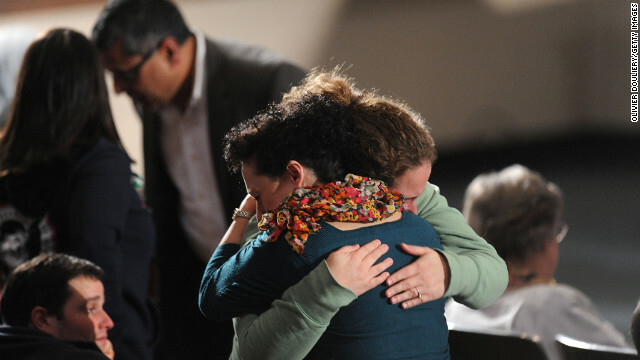 Two women embrace before the interfaith vigil at Newtown High School on Sunday evening. 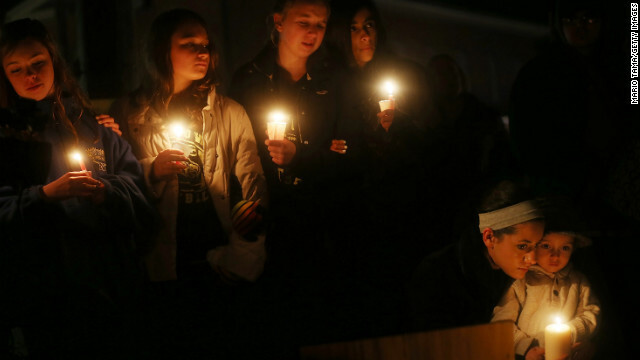 From left: Newtown residents Claire Swanson, Kate Suba, Jaden Albrecht, Simran Chand and New London, Connecticut, residents Rachel Pullen and her son, Landon DeCecco, hold candles at a memorial for victims on Sunday, December 16, in Newtown, Connecticut. 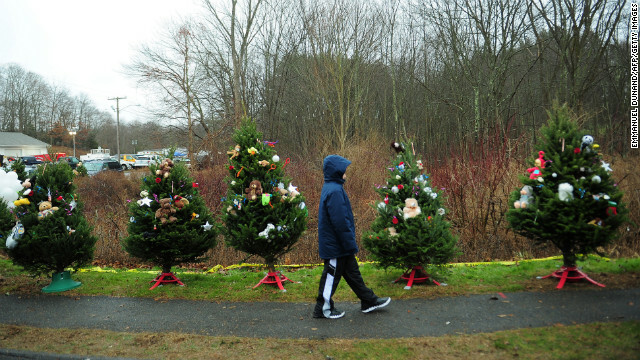 A young boy walks past Christmas trees set up at a makeshift shrine to the shooting victims in Newtown, Connecticut, on December 16. 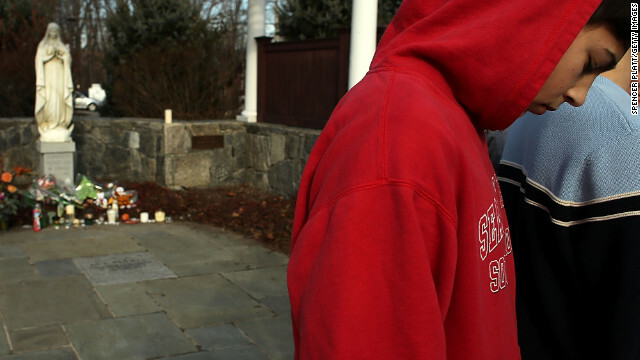 Ty Diaz is kissed by his mother, Yvette, at a memorial down the street from Sandy Hook on December 16. Teddy bears, flowers and candles in memory of those killed are left at a memorial down the street from the school on December 16. 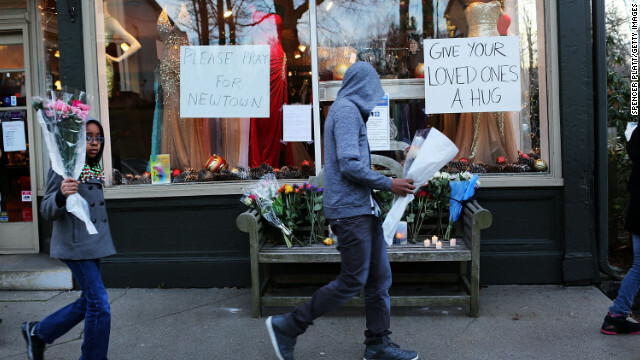 Two teenagers embrace at a makeshift shrine to the victims in Newtown on December 16. 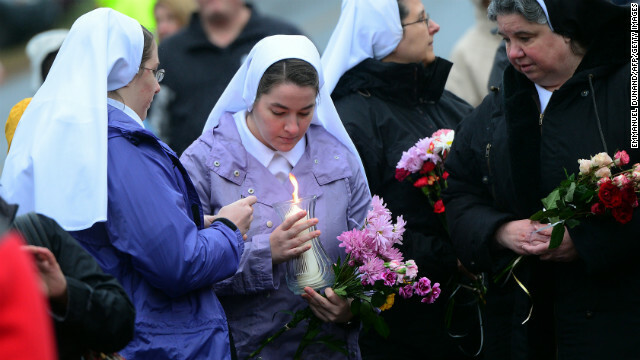 Nuns pay their respects at a makeshift shrine to the victims on December 16. 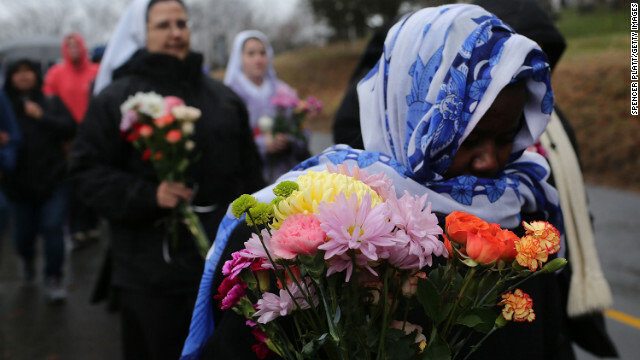 Members of Sisters of Christian Charity go to lay flowers in front of the Sandy Hook Elementary School on December 16 in Newtown. 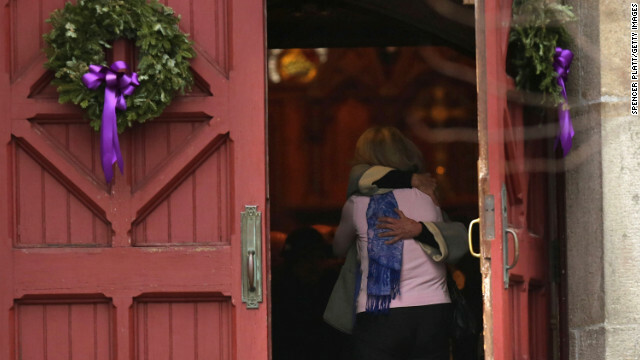 A woman receives a hug as she leaves morning service December 16 at Trinity Church in Newtown near the elementary school. 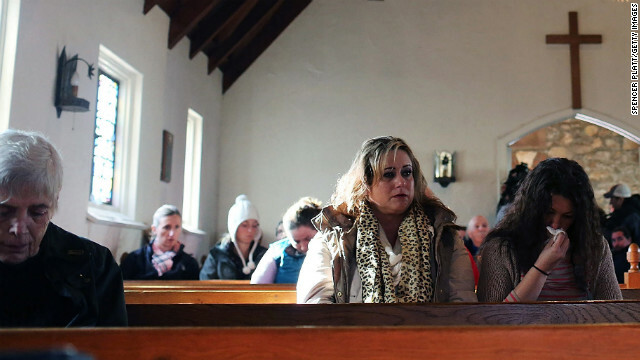 Parishioners pay their respects to the victims of the elementary school shooting while attending Mass at St. Rose of Lima Roman Catholic Church in Newtown on December 16. Police officers honor the victims of the school shooting at the St. Rose of Lima Roman Catholic Church on December 16 in Newtown. 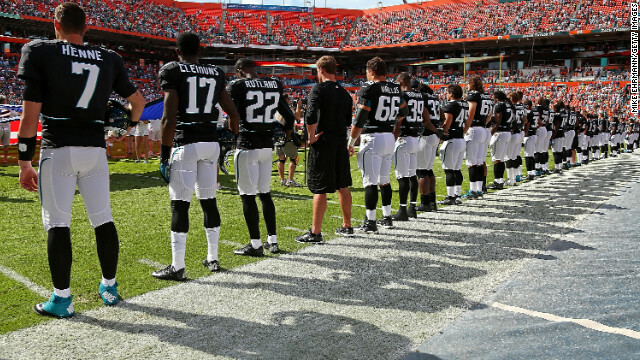 The Jacksonville Jaguars have a moment of silence in honor of the Sandy Hook Elementary School shooting victims before their game against the Miami Dolphins on December 16. A parishioner kneels in front of a makeshift memorial at St. Rose of Lima Roman Catholic Church in Newtown on December 16. 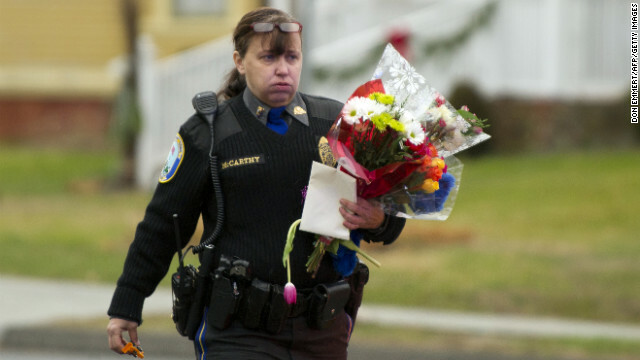 A police officer removes flowers from a busy intersection on December 16 in Newtown. 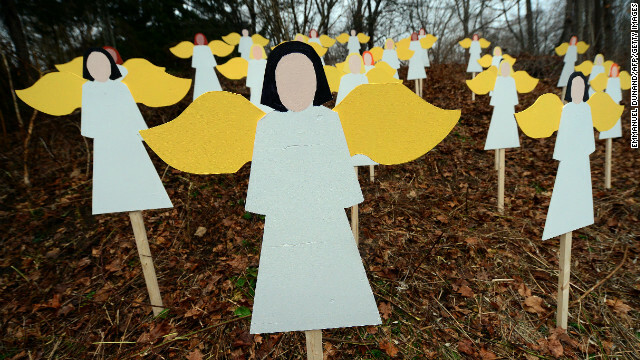 Police said they were afraid the memorial, left for the victims of the Sandy Hook Elementary School shooting, would cause a traffic hazard. 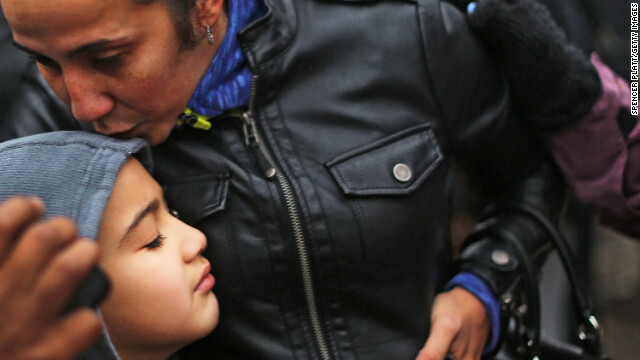 A woman hugs her daughter on the steps of Trinity Church on December 16 in Newtown. 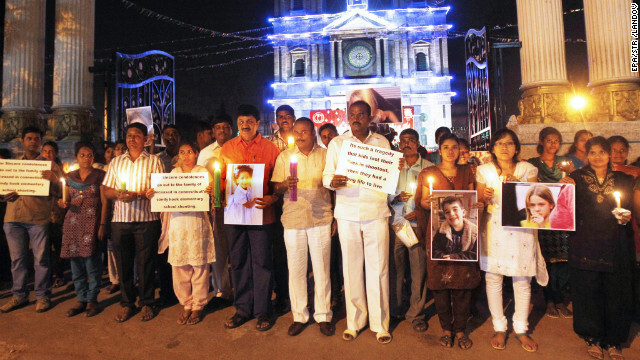 People in Bangalore, India, hold cards and photographs of the slain at a candlelight vigil outside a Catholic church on December 16. 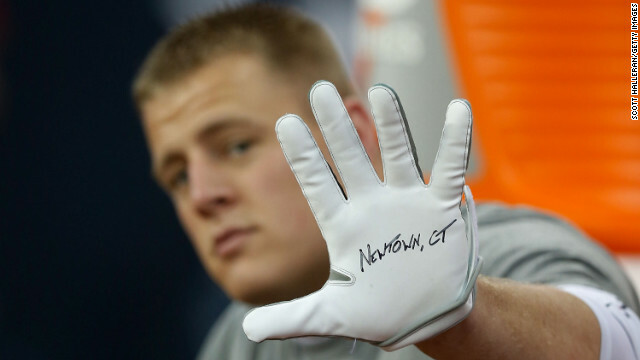 J.J. Watt of the Houston Texans shows his glove in remembrance of the victims before the start of a game against the Indianapolis Colts on December 16 in Houston. 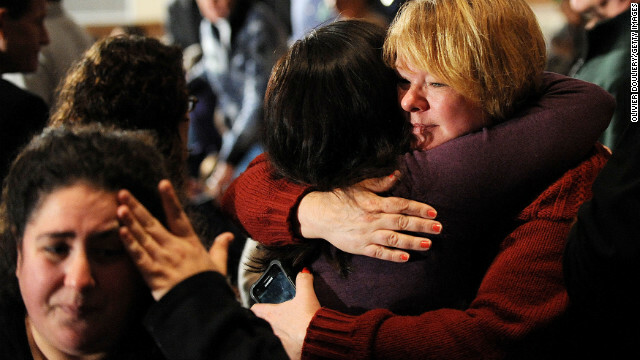 Donna Soto, right, mother of Victoria Soto, the first-grade teacher at Sandy Hook Elementary School who was shot and killed while protecting her students, hugs her daughter Karly while mourning their loss at a candlelight memorial at Stratford High School on Saturday, December 15, in Stratford, Connecticut. 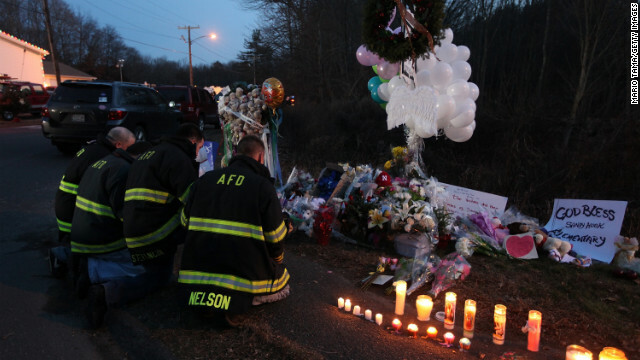 Firefighters kneel to pay their respects at a makeshift memorial near the school in Newtown on Saturday. 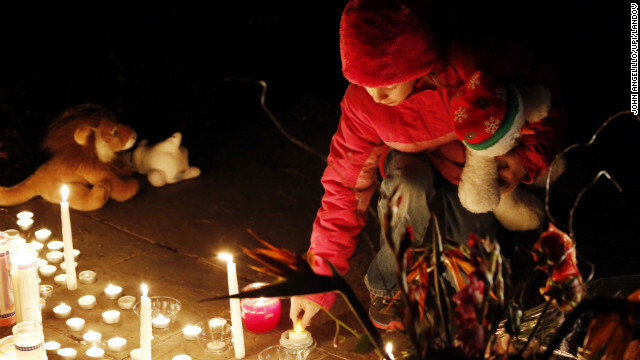 A child lights a candle at a memorial filled with flowers, stuffed toys and candles outside of Saint Rose of Lima Church near Sandy Hook Elementary School in Newtown, Connecticut on Saturday. 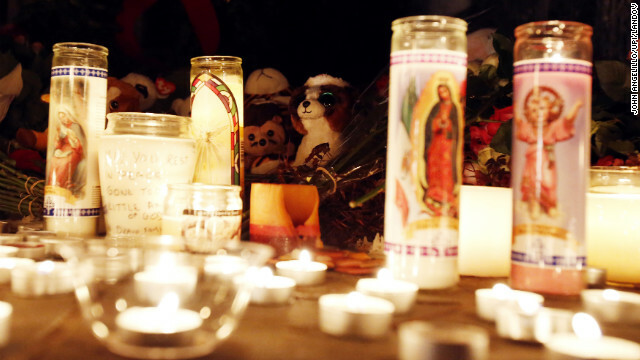 Candles light up a memorial outside of Saint Rose of Lima Church in Newtown. Lucas, Kelly and Michael DaSilva pray and embrace at a makeshift memorial near the school in Newtown. 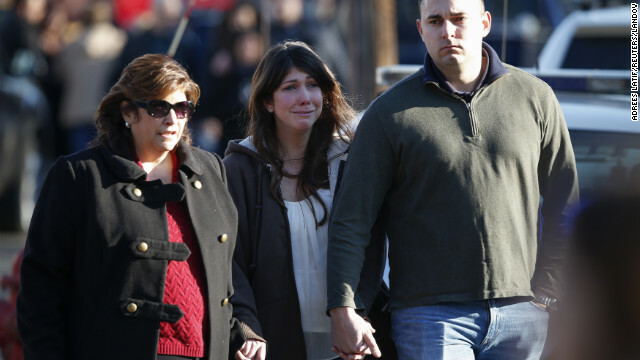 People are overcome with emotion Saturday at a makeshift memorial near Sandy Hook Elementary School in Newtown. 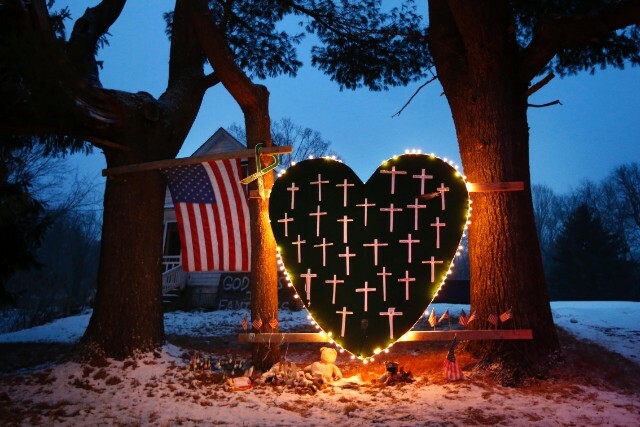 Residents arrive Saturday to pay tribute to the victims of an elementary school shooting in Newtown, Connecticut. 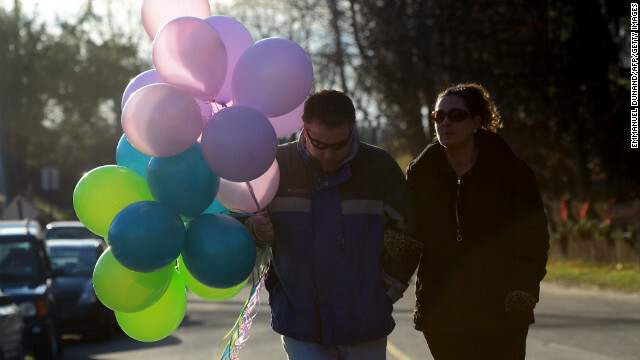 A couple carry balloons to place at a curbside shrine to in Newtown on Saturday. 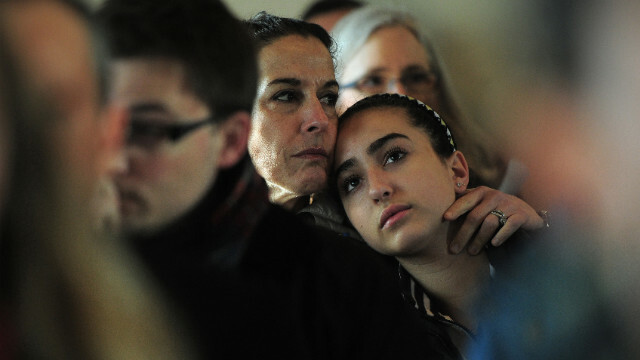 A mother and daughter attend a prayer service at St. John's Episcopal Church in Newtown on Saturday. 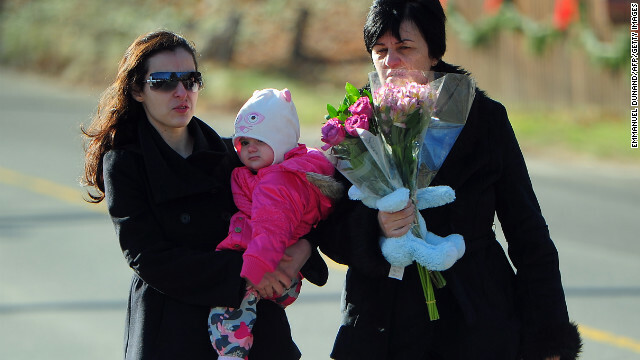 Flowers and signs of sympathy adorn the street leading to Sandy Hook Elementary School. 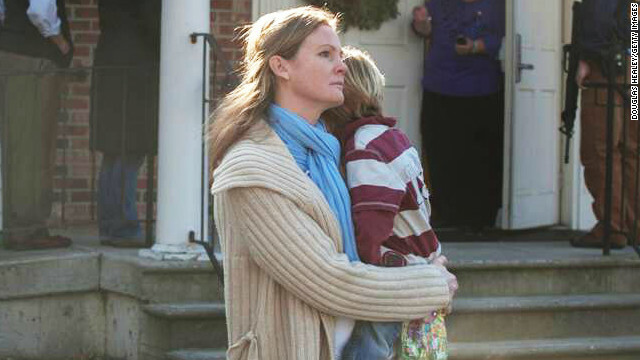 Claudia Urbiana and daughter Jocelyne Cardenas, left, hug outside of the entrance to the Sandy Hook school. 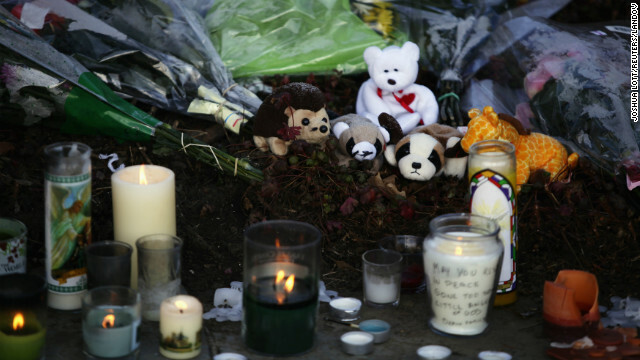 A makeshift memorial with flowers, stuffed toys and candles sit outside Saint Rose of Lima Roman Catholic Church in Newtown, Connecticut, on Saturday. 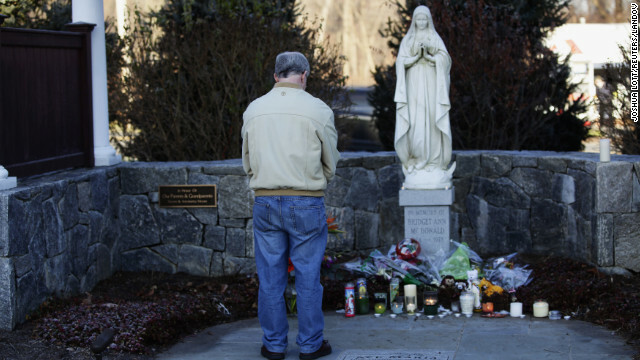 A man bows his head as he stands at a makeshift memorial, outside Saint Rose of Lima Roman Catholic Church in Newtown on Saturday, December 15. 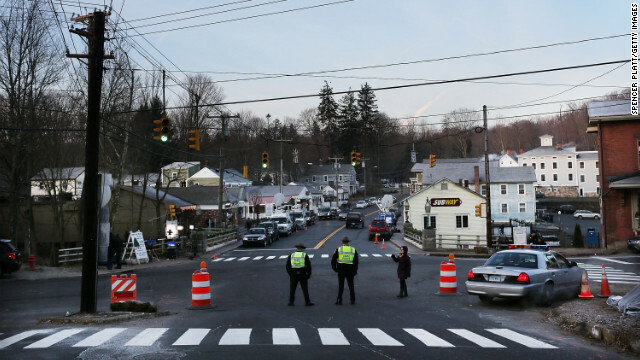 New Jersey resident Steve Wruble, who was moved to drive out to Connecticut to support local residents, grieves for victims at the entrance to Sandy Hook village in Newtown on Saturday. 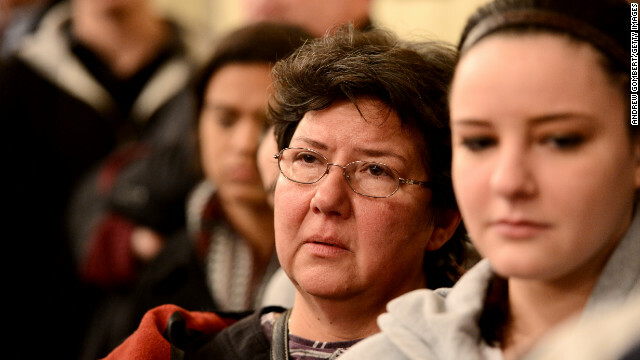 People attend a prayer service in Newtown on Saturday to reflect. 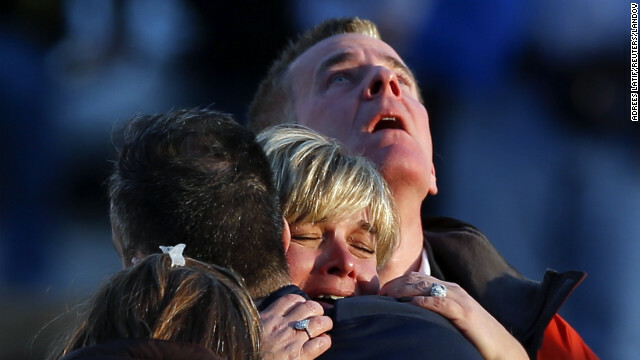 A mother hugs her children after paying tribute to the victims in Newtown on Saturday, December 15. 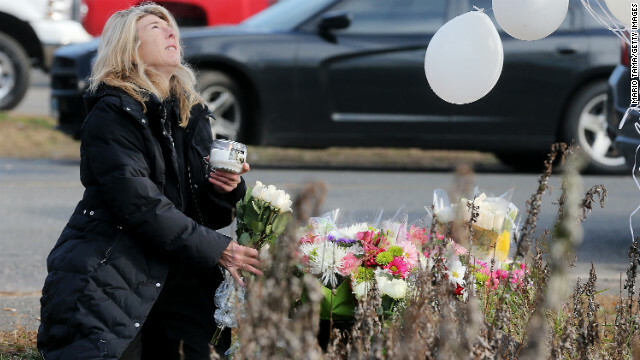 Andrea Jaeger places flowers and a candle at a makeshift memorial outside a firehouse near Sandy Hook Elementary School on Saturday. 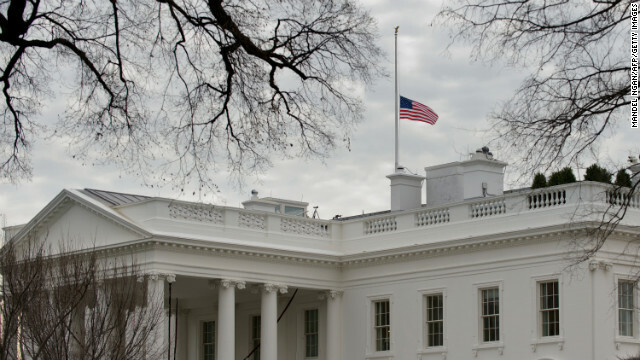 The U.S. flag flies at half-staff above the White House on Saturday. 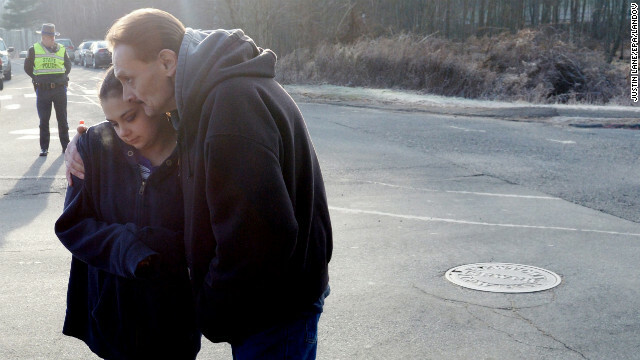 Ken Kowalsky and his daughter Rebecca, 13, embrace while standing at the end of the road leading to Sandy Hook Elementary School on Saturday. 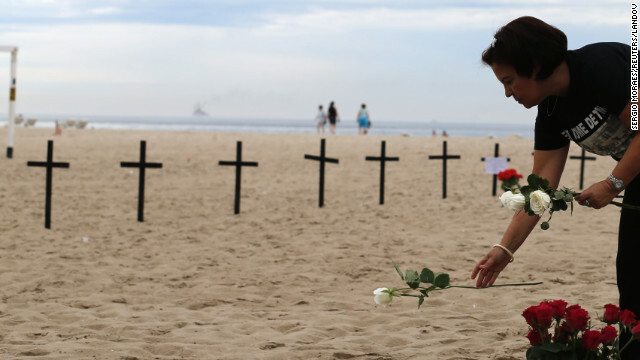 A woman puts a flower near crosses planted by Rio de Paz (Rio of Peace), in memory of the victims of the Sandy Hook Elementary school shooting on Copacabana beach in Rio de Janeiro on Saturday. A woman sits during a service at the Asylum Hill Congregational Church in Hartford, Connecticut on Friday, December 14. 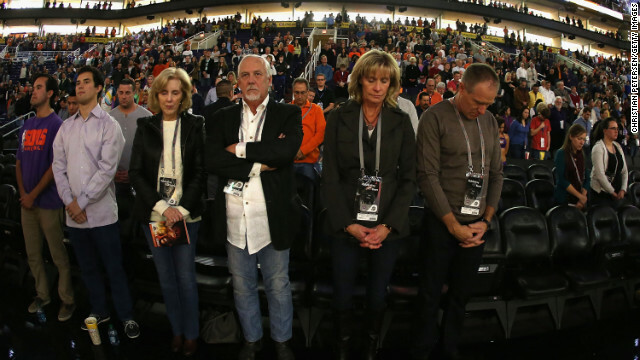 Fans at the NBA game between the Utah Jazz and the Phoenix Suns participate in a moment of silence for the victims of the Newtown shooting on Friday in Phoenix. 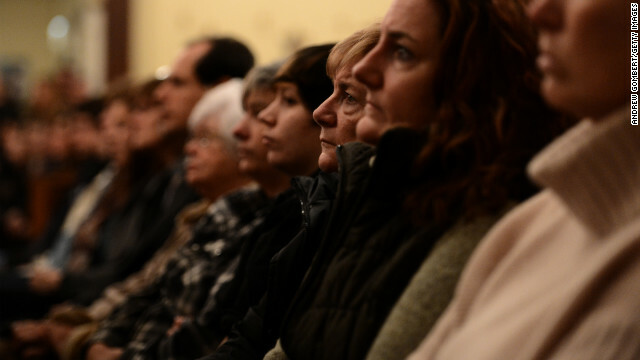 An overflow crowd listens to a church service held at the St. Rose of Lima Catholic Church in Newtown on December 14. 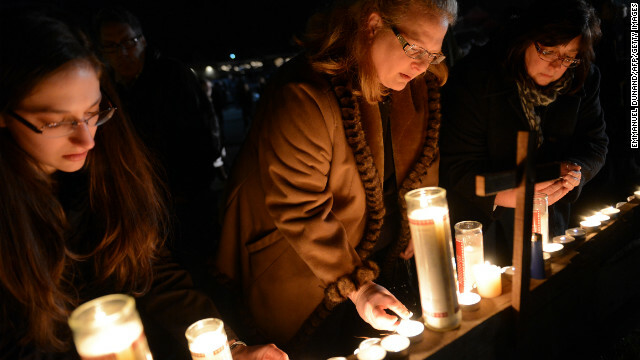 People gather for a prayer vigil at St. Rose Church on Friday. 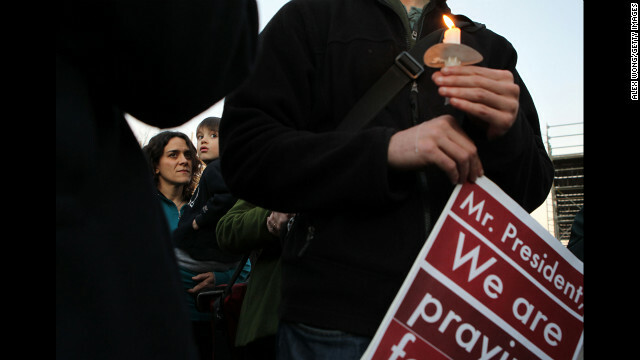 People gather for a vigil outside the White House in Washington following the Connecticut elementary school shooting on Friday. 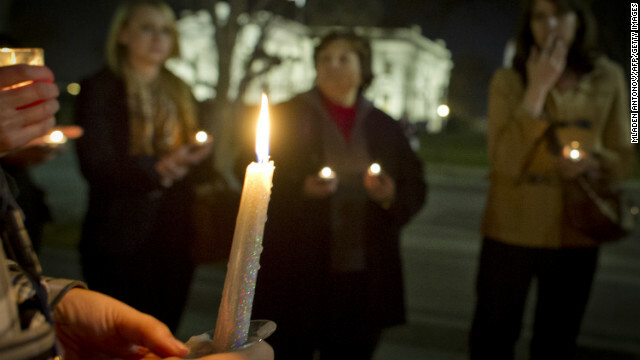 Candles burn as people gather for a vigil outside the White House. 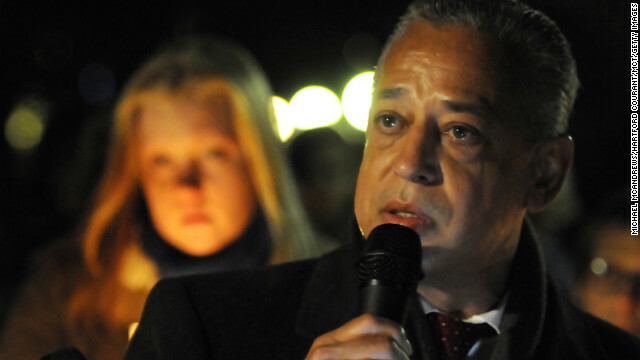 Hartford, Connecticut, Mayor Padro Segarra speaks emotionally about the students and teachers who died earlier in the day at Sandy Hook Elementary School in nearby Newtown at a candlelight vigil at Bushnell Park in Hartford on Friday. Cynthia Alvarez is comforted by her mother, Lilia, as people gather for a prayer vigil at St. Rose of Lima Roman Catholic Church in Newtown. People gather for a prayer vigil at St. Rose Church in Newtown. People gather for a prayer vigil at St. Rose Church. 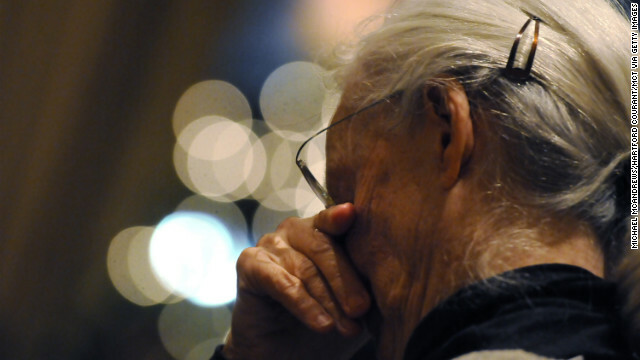 A woman bows her head during a vigil for the shooting victims at St. Rose Church. People gather in the St. Rose Church for a memorial service Friday. 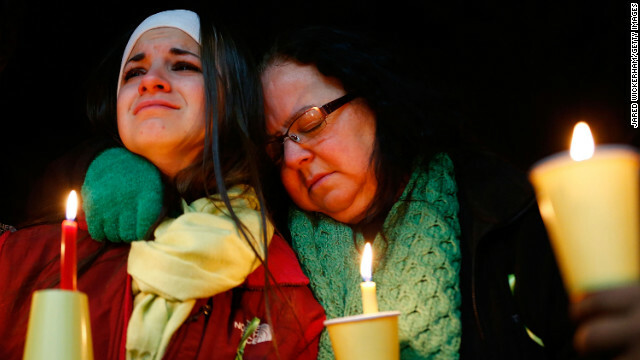 Women comfort each other during the vigil at St. Rose Church. 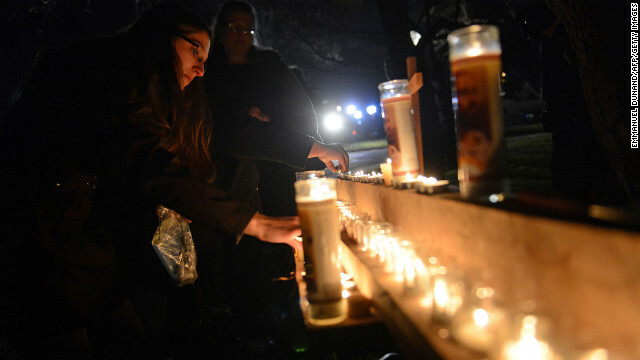 A woman looks on during the vigil at St. Rose Church. People hug outside of the Newtown United Methodist Church on Friday, near the site of the shootings at the Sandy Hook school. 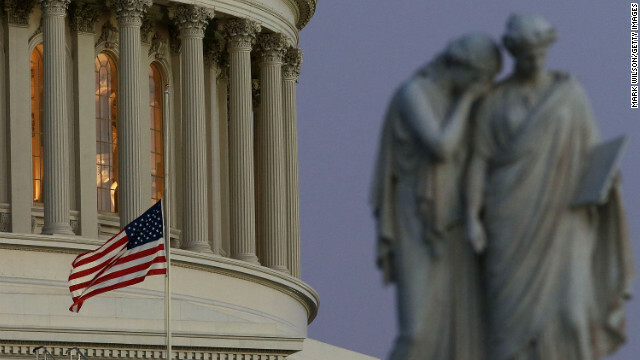 A flag at the U.S. Capitol flies at half-staff after President Barack Obama ordered the action while speaking from the White House. Obama called for "meaningful action" in the wake of the school shooting. 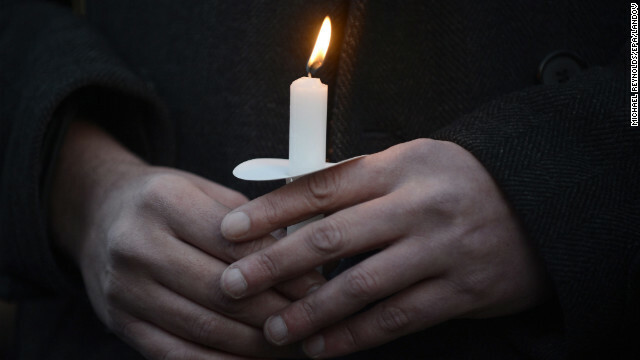 Julie Henson of San Francisco joins other people outside the White House to participate in a candlelight vigil on Friday. 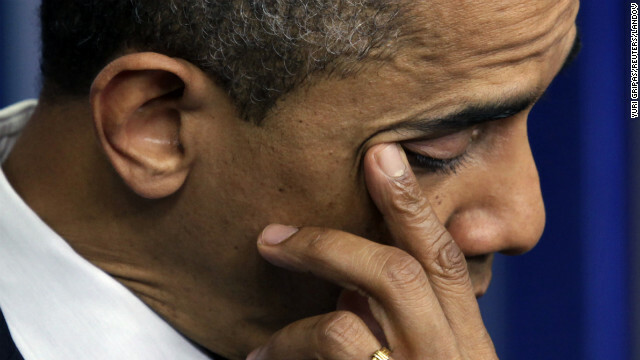 Obama wipes tears as he makes a statement in response to the shooting on Friday. Washington resident Rachel Perrone, left, and her 5-year-old son, Joe, center, join others outside the White House in a candlelight vigil. 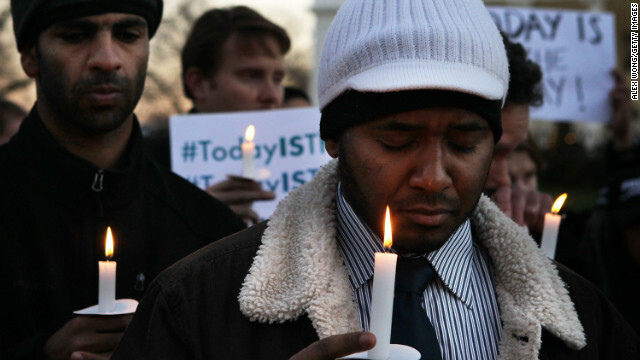 Faisal Ali, right, of Colorado Springs, Colorado, joins the vigil outside the White House. 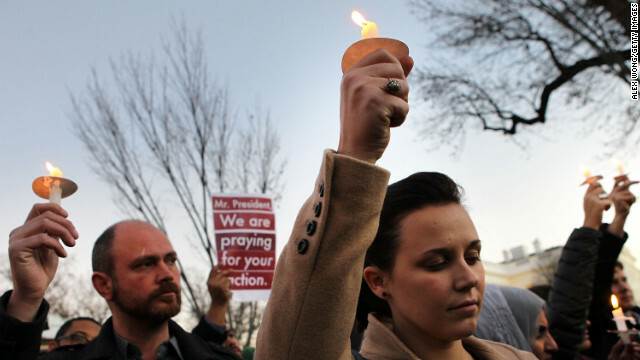 People gather outside the White House to participate in a candlelight vigil. 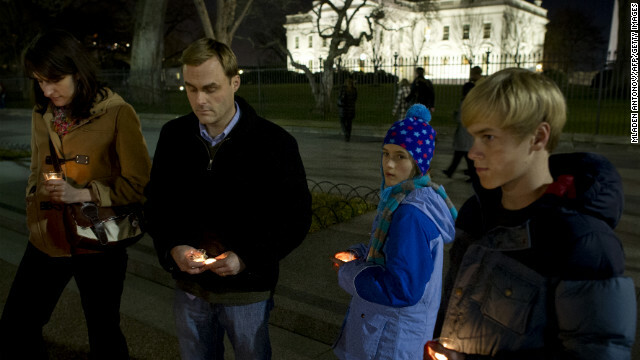 Supporters of gun control hold a candlelight vigil for victims of the shooting outside the White House. If 20-year-old Lanza and 26-year-old Jared Loughner had been forced into treatment, Murphy says, the tragedies in Newtown and Tucson could have been averted. Loughner pleaded guilty in the January 8, 2011, attack that killed six and wounded Arizona Rep. Gabby Giffords and 12 others -- and was diagnosed paranoid schizophrenic only after he went to prison. Patient advocacy groups always say, " 'Well, you couldn't have predicted that.' Yes, you can," Murphy says, his voice rising. "In each of those cases, the family knew that their son had a serious mental illness, and they couldn't get them help." Laws prevent parents and caregivers from being involved in children's health care decisions once they turn 18 -- even for the most seriously mentally ill who have cycled in and out of psychiatric care for years. His bill -- introduced this time last year -- would allow more parental involvement in a young adult's care, create a new assistant secretary for mental health and make it easier to commit people to court-ordered treatment against their will. The issue of forced treatment is highly contentious among civil libertarians and patient rights advocates. It ignited a civil war inside the mental health community. The key argument: Should a seriously mentally ill patient be medicated over their objections as a last resort, or does that approach violate their civil liberties? 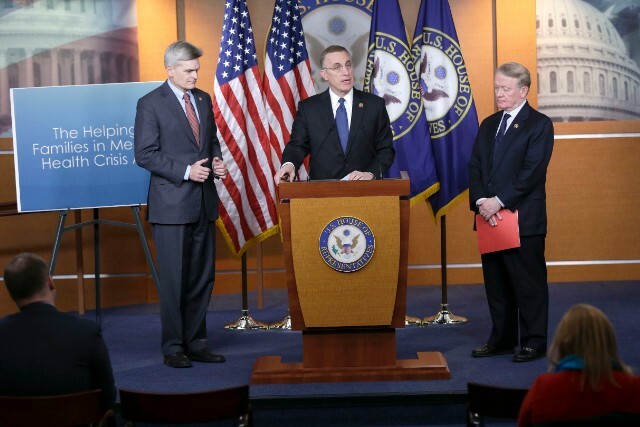 Murphy's bill would also gut more than $400 million from the Substance Abuse and Mental Health Services Administration (SAMHSA) and move the money to the National Institutes of Mental Health for effective programs with evidence-based research to get people better. As Murphy puts it, treatment should be "led by a doctor, not a lawyer." "We need to bring mental health treatment into the 21st century," he says. Patient rights groups wholeheartedly reject his approach. They see his bill as a two-pronged attack: They lose funding, and the mentally ill lose rights. Murphy's supporters consider him a savior of the mentally ill. His critics call him a bully trampling individuals' rights. Though his bill will die in this lame-duck session, he will reintroduce the legislation, possibly with some tweaks, next year to a GOP-controlled Congress. He has 115 co-sponsors, including nearly 40 Democrats onboard. To the families he has met over the past two years, he has a message of hope: "Their voice is being heard, and it will not be simply dismissed." "Our bill really pushes for solutions to help address the unique needs of not only those with serious mental illness, but families and communities and caregivers." 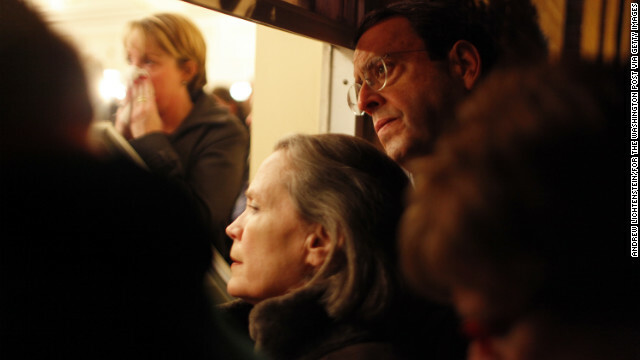 Congress has done little to answer calls for gun control and mental health reform since Newtown. Murphy grew up one of 11 children, the fourth from the oldest in his family. His father was a podiatrist, and his mother was a nurse. His first paying job, at 10, was cleaning horse stables at a nearby farm. "We mucked up the stalls for 50 cents, and I could ride horses," he says. "I like to say that sometimes the difference between that and Congress is: I don't get to ride horses." Living in a large household helped shape his views. Siblings, cousins, aunts and uncles crammed the home for family events. There were things every family member knew, Murphy says, but no one ever talked about. "And those things take a toll on a family," he says. "And maybe it was the sum of those many experiences that certainly drove me to, instead of being afraid of mental illness, to be compassionate and driven towards saying, 'I'm going to walk into this and dedicate my life to changing things so that other people don't have to feel the pain.' "
Pressed about his devotion to the mentally ill, Murphy, 62, says he watched "things erode and decay" during his formative years with friends and family. But he stops there, saying only that there was a great deal of sadness involved. "Some day I'll disclose," Murphy says, "but I'm not comfortable with that yet." His interest in psychology grew as he went off to college. He earned his bachelor degree from Wheeling Jesuit University in West Virginia in 1970, before seeking a master's in clinical psychology from Cleveland State University and working at a community mental health center. "I found the field of psychology fascinating," he says. "The more I got into it, the more I felt this is where I could make some difference." He earned his PhD in psychology from the University of Pittsburgh and worked in various Pennsylvania hospitals. He became an assistant professor of psychology at the University of Pittsburgh and was known as "Dr. Tim" from appearances on local television. He opened his private practice around 1987. He came along at a time when the main psychiatric hospital in Pennsylvania, even in the early 1980s, still used archaic treatment practices, such as dunking patients suffering from depression into ice water, thinking it would snap them out of it. "The asylums of yesteryear needed to be torn down," he says. As a young psychologist, he heard horrific stories of sexual abuse of children and "physical beatings that were awful." He counseled those children and fought for their well-being. More recently, he joined the Naval Reserve in 2009, and every month spends two days at Walter Reed hospital counseling war veterans suffering from traumatic brain injuries and post-traumatic stress disorder. "I thought if I'm going to be voting to send them over to war, then I have a responsibility to help them when they return," Murphy says. When he informed a wife of the extent of her husband's war wounds, she left him; the spouse of another had the opposite reaction: "If it takes me 50 years, I'll teach him to laugh and love again." In the stories and struggles of his patients, Murphy finds resolve. "You develop a lot of what they call 'compassion fatigue,' " he says. "But then, I'd say, 'That's nothing compared to what people face.' And it just gives you strength." Dennis Roddy, a long-time journalist in Pittsburgh who went on to become an aide to Pennsylvania Gov. Tom Corbett, says it was considered an oddity when Murphy became a state senator in 1996. The stigma of mental illness was so prevalent, Roddy says, that some constituents had a hard time with the thought of a psychologist in office and wondered: "Should we feel comfortable about it?" "He was at the forefront of the politicians who recognized the dilemma" of mental illness, Roddy adds. "When he got into Congress, he waited and worked his way until he was in a position to do something about it." Politics PA, a buzzy blog tracking the state's political scene from Erie to Philadelphia, once dubbed Murphy one of the smartest lawmakers in the state. "He has the capacity to pay attention and the talent to listen," Roddy says. "This psychologist doesn't look at the clock and say, 'I see our time is up.' 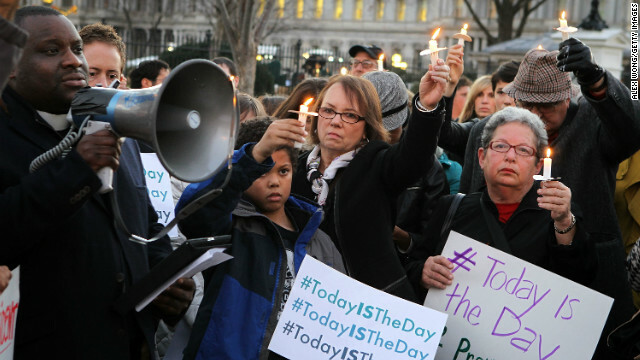 "
Last year Murphy introduced the most sweeping mental health bill in more than two decades. Curt Decker, executive director of the National Disability Rights Network, doesn't buy it. He believes Murphy used his position as a psychologist to curry favor among GOP leadership, "bootstrapped onto Newtown" and was sold a bill of goods by those who believe medication over objection is the answer to treating the seriously mentally ill.
"I would say he puts out there that he cares about this population, and he really doesn't," Decker says. "In the meantime, it adds to the stigma." The Murphy bill, he says, focuses on a "coercive lock-them-up and throw-away-the-key kind of approach and ignores the whole movement that's been going on in the mental health community for the last couple decades" -- one based on recovery and support systems within communities. Decker agrees with Murphy that the mental health system must be revamped to repair "this really dangerous patchwork of services." He just doesn't like Murphy's approach. To be clear, Decker has a beef with Murphy. He says his Disability Rights Network would see its federal funding shrink from $38 million a year to $5 million under Murphy's plan. He says Murphy puts on this public persona that he's willing to work with his opponents, but then "he brings them in and yells at them." 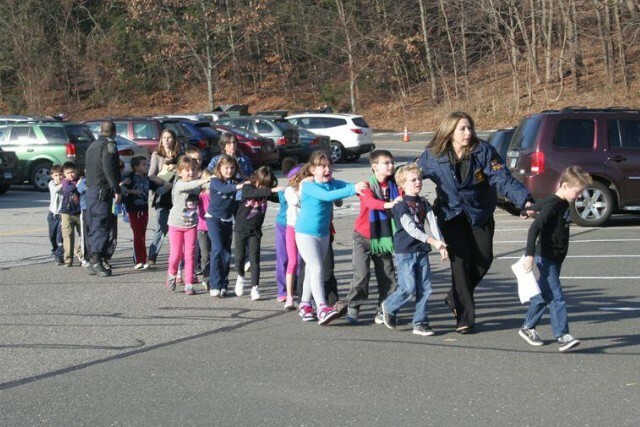 Children in Newtown, Connecticut, return to school on December 18, 2012, four days after the shooting at Sandy Hook Elementary School. 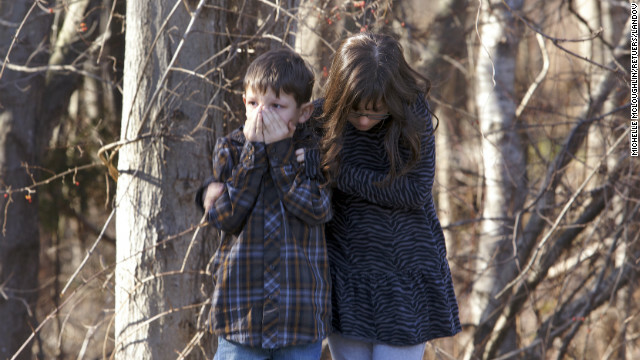 Adam Lanza opened fire in the school, killing 20 children and six adults before killing himself. Police say he also shot and killed his mother in her Newtown home. 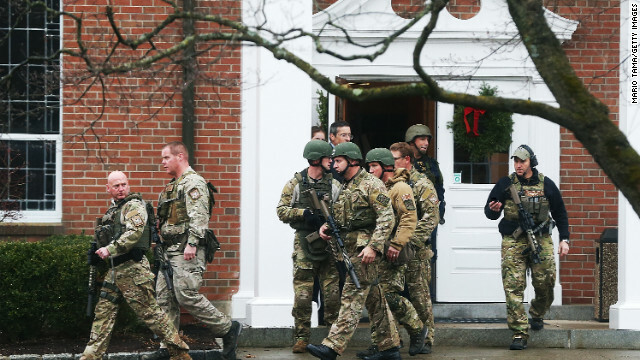 Connecticut State Police officers search outside St. Rose of Lima Roman Catholic Church in Newtown, Connecticut, on Tuesday, December 16, after a threat prompted authorities to evacuate the building. Investigators found nothing to substantiate the reported threat, a police official said, declining to provide additional details. 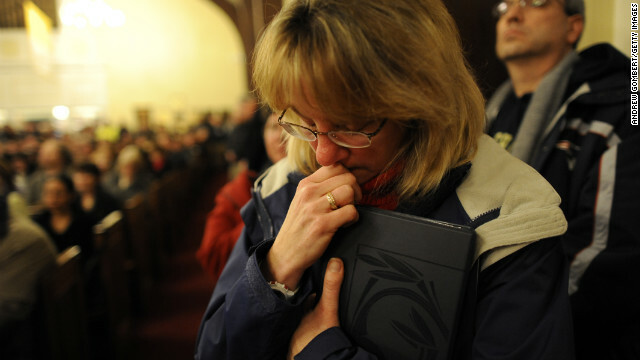 The church held Sunday services following the mass shooting at Sandy Hook Elementary School in Newtown. 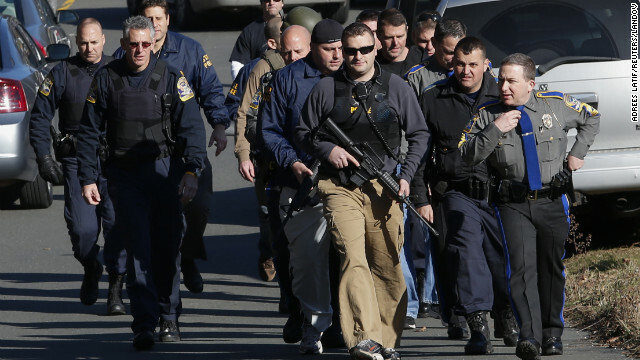 Connecticut State Police officers walk out of St. Rose of Lima Roman Catholic Church after the Newtown church received a threat December 16. 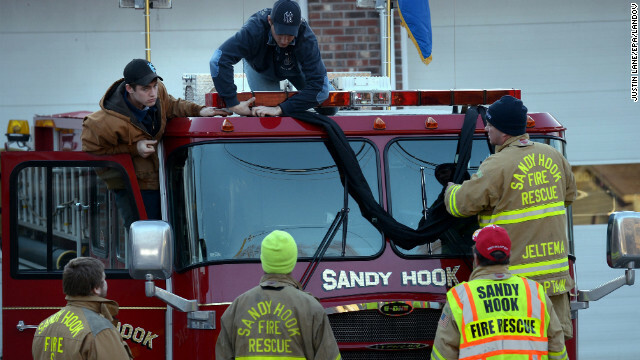 Firefighters attach black bunting to a fire truck as a memorial at the fire station down the street from the Sandy Hook Elementary School in Newtown, Connecticut, on Saturday, December 15. 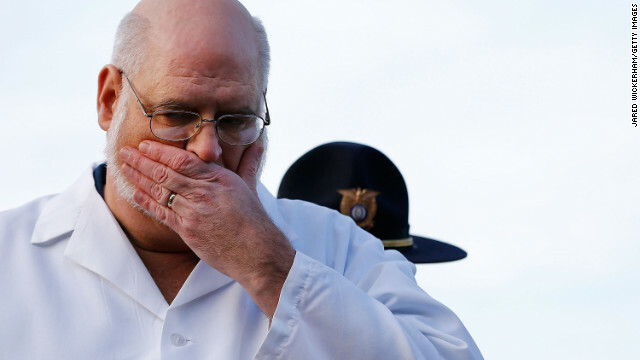 Connecticut Chief Medical Examiner H. Wayne Carver II talks to the media about the elementary school shooting during a press conference at Treadwell Memorial Park on December 15. 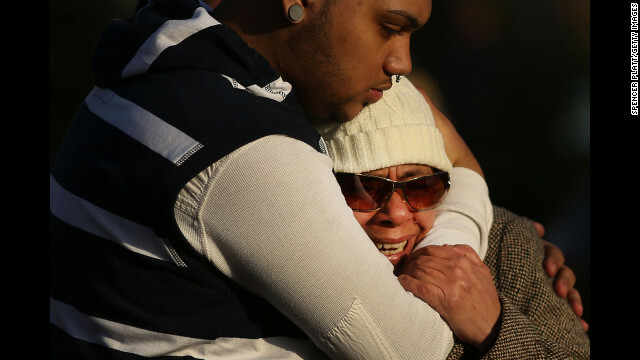 Zulma Sein is hugged by a family member outside of the entrance to the Sandy Hook School on Saturday. 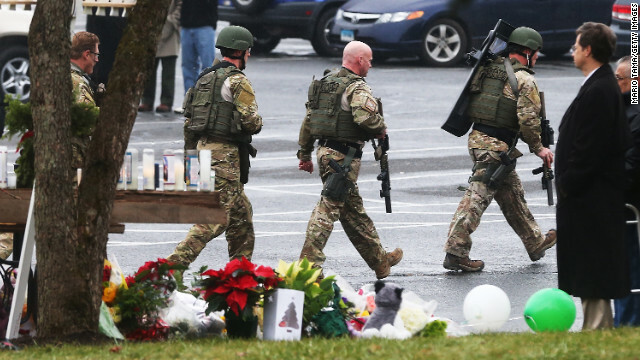 Police officers keep guard at the entrance to the street leading to the Sandy Hook Elementary School on Saturday, December 15. 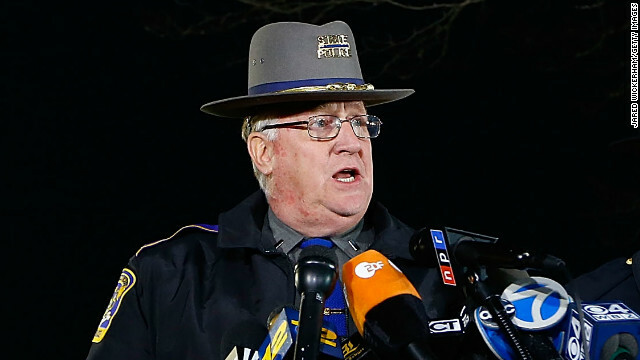 Connecticut State Police Lt. Paul Vance addresses the press on December 15. 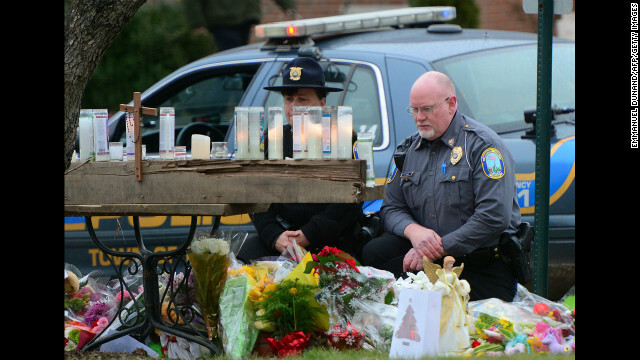 Police officers stand at the entrance to the street leading to the Sandy Hook Elementary School on December 15. 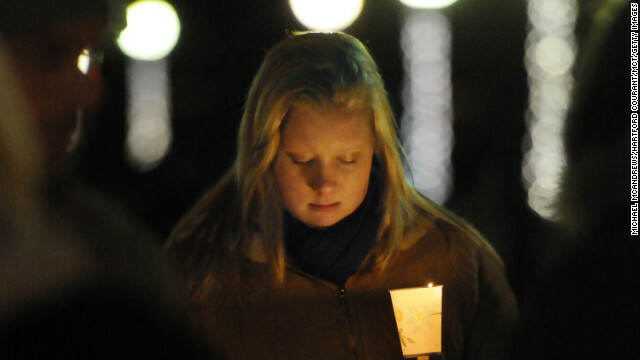 Corinne McLaughlin, a student at the University of Hartford, bows her head during a candlelight vigil at Hartford, Connecticut's Bushnell Park on Friday, December 14, honoring the students and teachers who died at Sandy Hook Elementary School in nearby Newtown earlier in the day. Distraught people leave the fire station after hearing news of their loved ones from officials on Friday. 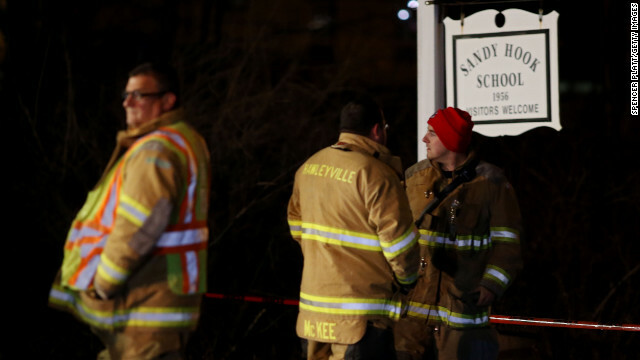 Emergency workers stand in front of the Sandy Hook Elementary School in Newtown. 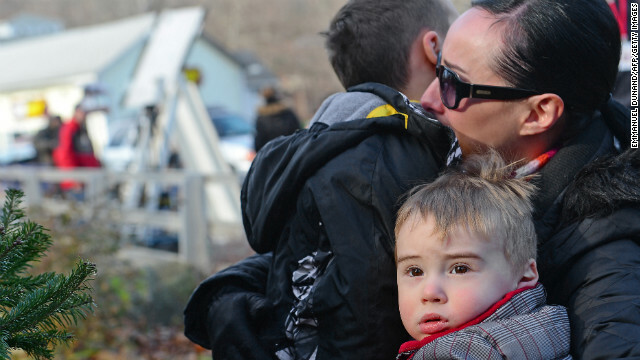 A child and her mother leave a staging area outside Sandy Hook Elementary School in Newtown, Connecticut, on December 14. 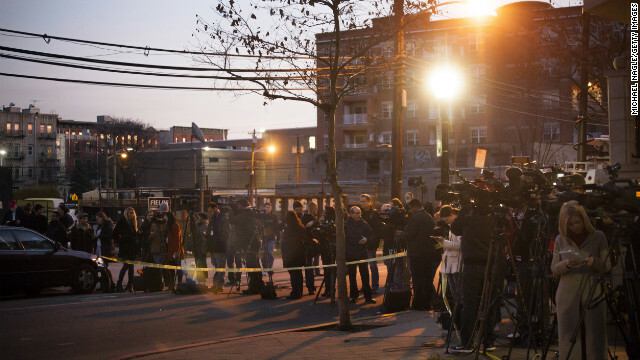 Members of the media converge on December 14 in front of an apartment at 1313 Grand Street in Hoboken, New Jersey. 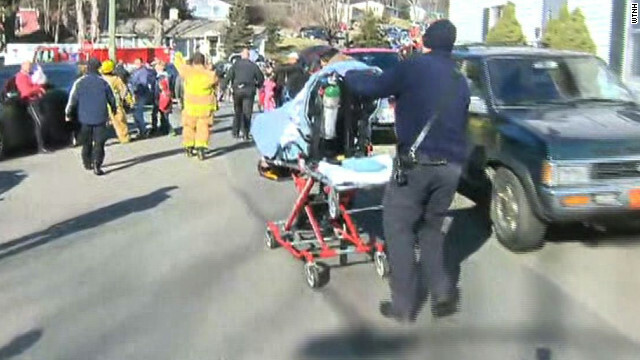 The apartment is believed to be connected to the Connecticut elementary school shooting. 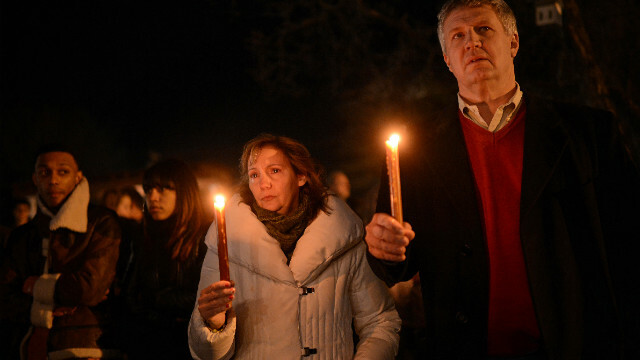 Faisal Ali, right, of Colorado Springs, Colorado, joins other people outside the White House on December 14 to participate in a candlelight vigil to remember the victims of the Sandy Hook Elementary School shooting. 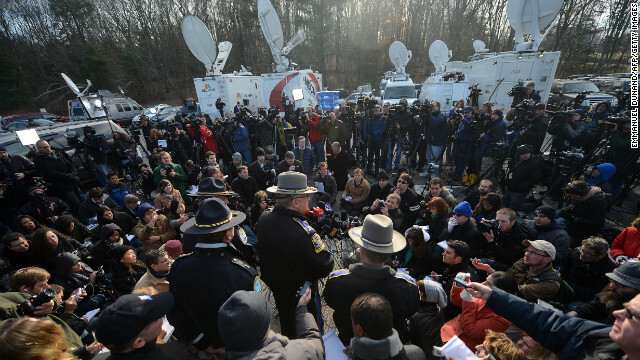 Connecticut State Police spokesman Lt. J. Paul Vance, center, briefs the media on the elementary school shootings during a press conference at Treadwell Memorial Park on December 14 in Newtown. 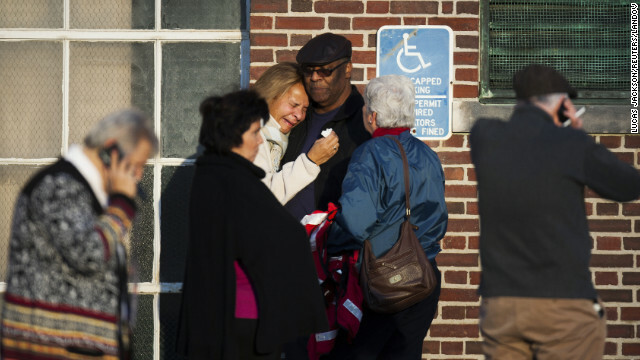 People weep and embrace near Sandy Hook Elementary School on Friday, December 14. 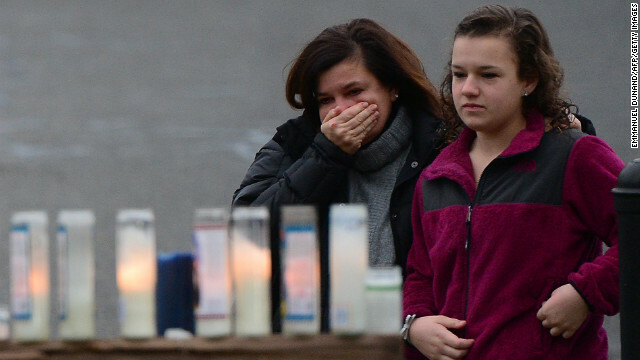 A woman leans on a man as she weeps near Sandy Hook Elementary School on December 14. 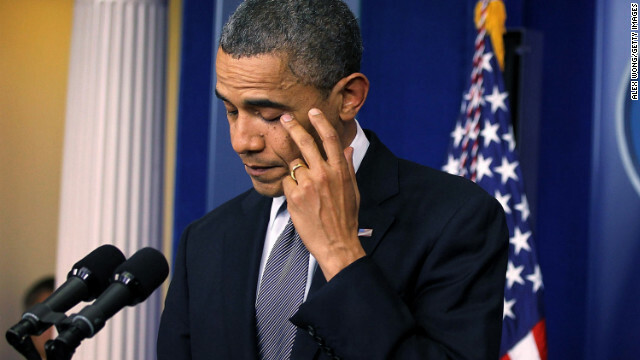 President Barack Obama wipes a tear as he speaks about the shooting at Sandy Hook Elementary School during a press briefing at the White House on December 14. 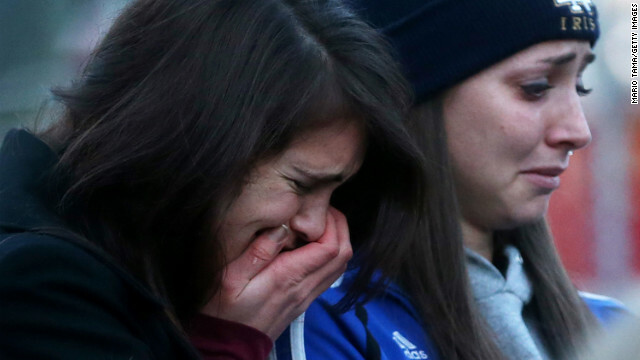 A woman weeps near the site of a shooting at Sandy Hook Elementary School on December 14. 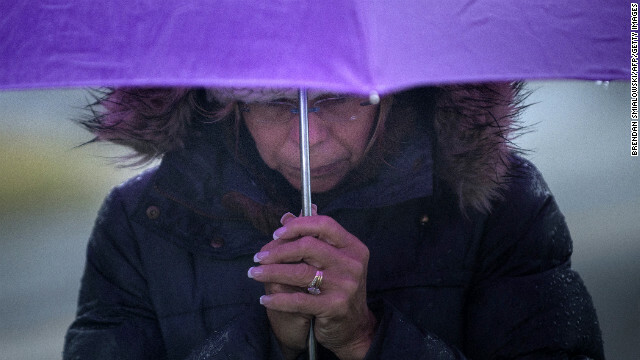 A woman weeps near Sandy Hook Elementary School on December 14. 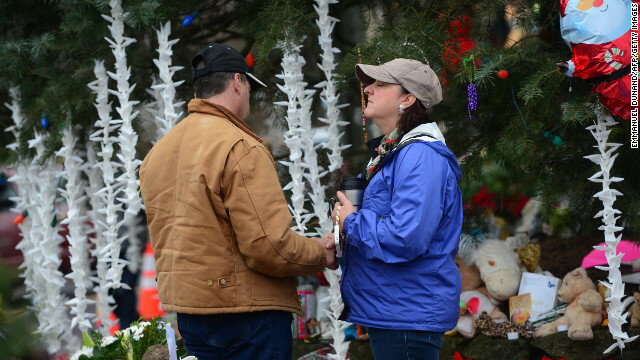 People comfort each other near Sandy Hook Elementary School on December 14. 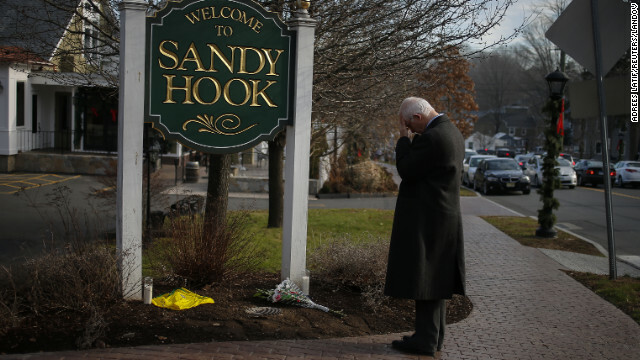 A man takes in the scene near Sandy Hook Elementary School on December 14. 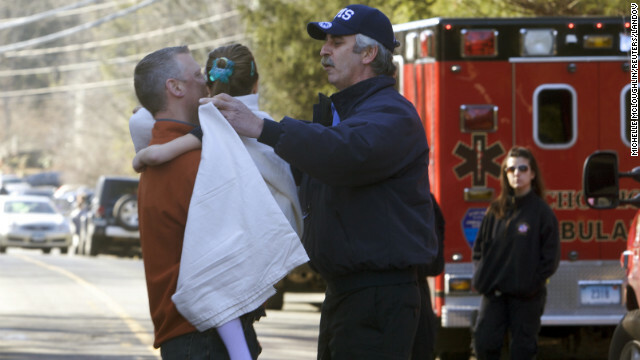 A young girl is given a blanket after being evacuated from Sandy Hook Elementary School on December 14. State police personnel lead children from the school. 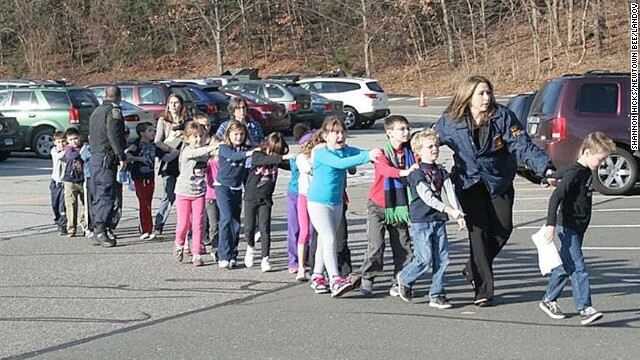 Children wait outside Sandy Hook Elementary School in Newtown, Connecticut, after the shooting. 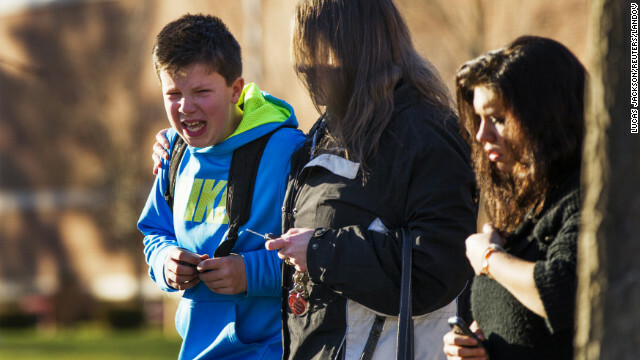 A boy weeps at Reed Intermediate School after getting news of the shooting at Sandy Hook Elementary School on December 14. 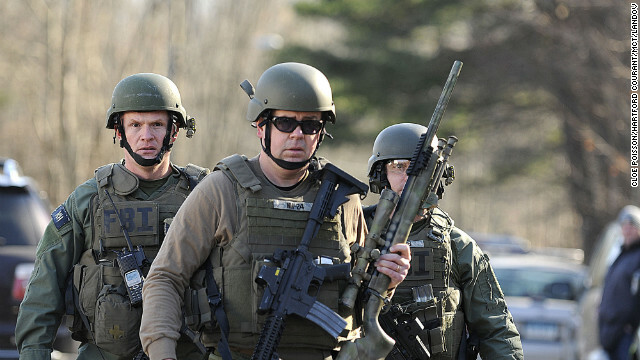 FBI SWAT team members walk along Dickinson Drive near Sandy Hook Elementary School on December 14. An aerial view of Sandy Hook Elementary School in Newtown, Connecticut on December 14. 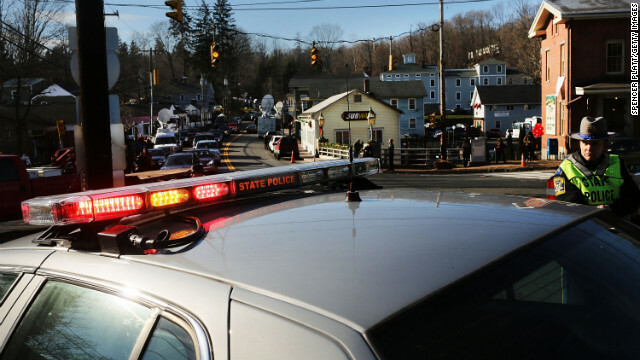 Connecticut State Troopers arrive on the scene outside Sandy Hook Elementary School on December 14. 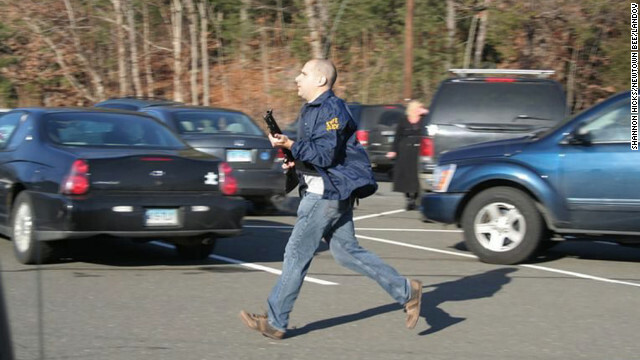 A Connecticut State Police officer runs with a shotgun at the Sandy Hook Elementary School in Newtown on December 14. Police patrol the streets around Sandy Hook Elementary School on December 14. 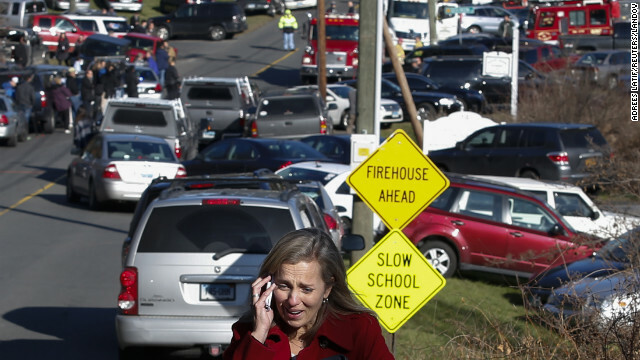 People try to deal with the shock of the attack outside Sandy Hook Elementary School on December 14. 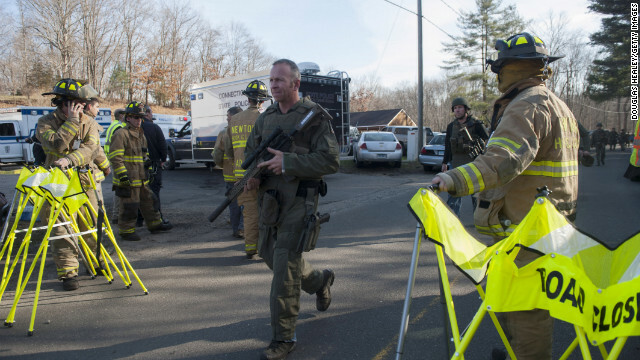 Connecticut State Police secure the scene of the shooting on December 14. 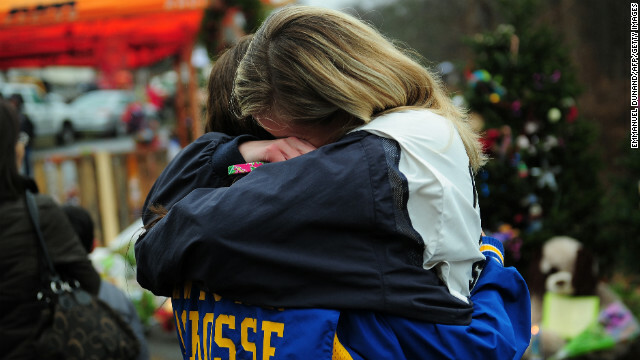 People embrace outside Sandy Hook Elementary School on December 14. 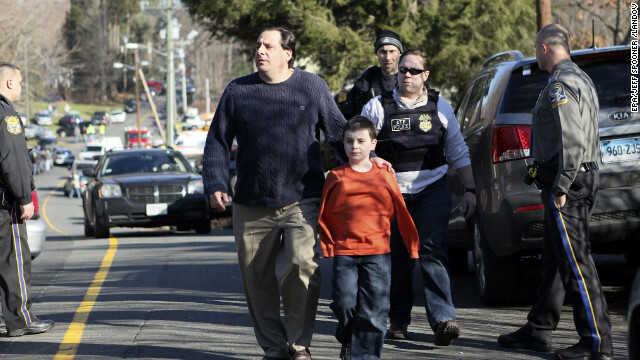 A man escorts his son away from Sandy Hook Elementary School on December 14. 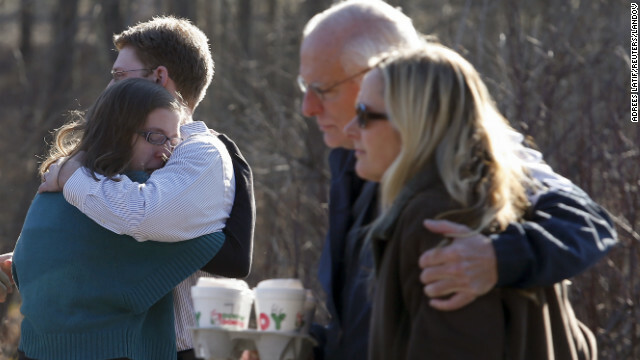 People take in the news outside Sandy Hook Elementary School on December 14. People line up to enter Newtown Methodist Church near the the scene of the shooting on December 14. 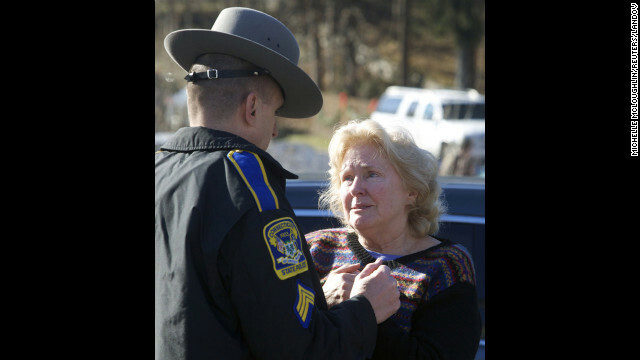 A woman speaks with a Connecticut state trooper outside Sandy Hook Elementary School on December 14. 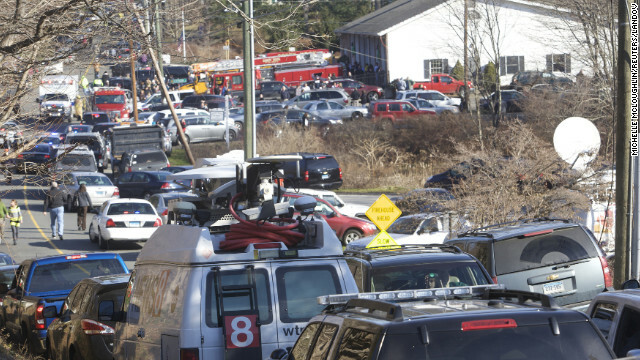 The streets around Sandy Hook Elementary are packed with first responders and other vehicles. 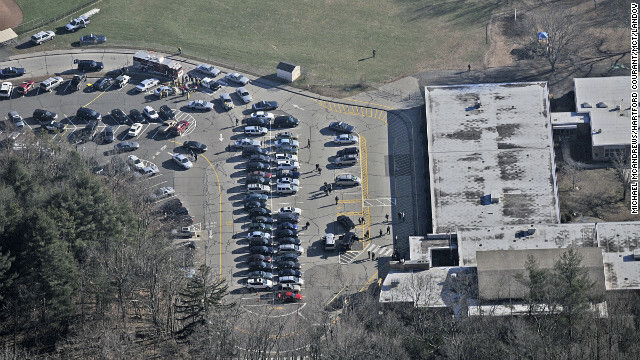 A view of the scene at Sandy Hook Elementary School after the shooting. 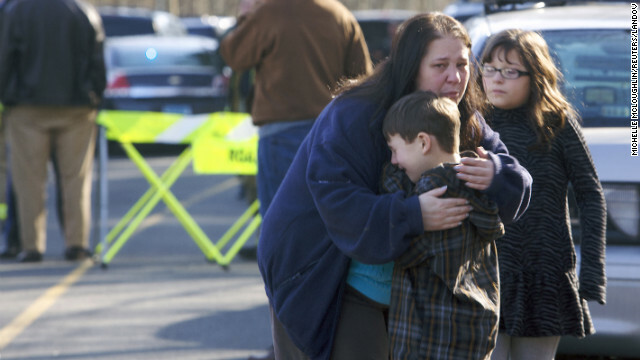 A young boy is comforted outside Sandy Hook Elementary School on December 14. People embrace each other on December 14. His group represents thousands of mentally ill patients around the country to make sure the abuses of the past never return. Nancy Jensen testified before one of Murphy's congressional hearings. A victim of sexual and physical abuse at a Kansas group home, Jensen urged lawmakers not to support the bill because of massive cuts to patient advocacy groups, like the ones that saved her from further horrors. "What he's trying to do is kind of scary," she says. "If he takes away Protection and Advocacy for Individuals with Mental Illness, then we do go back to the Dark Ages where we can be involuntarily committed someplace and abused and neglected." On that point, Murphy pushes back. And hard. Spinmasters, he says, have distorted his bill to scare away support. He is all for current comprehensive approaches -- peer support, medication, psychotherapy, group therapy, safe housing. Yet he ardently rejects the status quo -- $130 billion in federal funds, with what he says are millions upon millions being wasted on "feel-good" programs that don't work. If patient advocacy programs were so effective, he says, then why over the past 20 years "have we seen an increase in incarcerations, suicides, substance abuse, suicide attempts, suicidal thoughts, homelessness, disability and unemployment among the mentally ill."
"On every metric," Murphy says, "this country is failing." His opponents, he says, are perfectly fine with the mentally ill going untreated: "These groups push for a right to be sick, a right to be homeless, a right to be in jail, a right to be unemployed." "If people want to defend that, then put that in front of the American public, because the American public does not agree with them. People have a right to get better." There is no doubt that treatment works, Murphy says, even for the most seriously mentally ill. He knows that from counseling hundreds of patients over the years and from court-ordered programs that help the seriously mentally ill, but only after they have committed a major crime. "Why not fight for what is right, what is appropriate, what is necessary?" Despite critics. Despite a stalled Congress. Despite waning public interest. 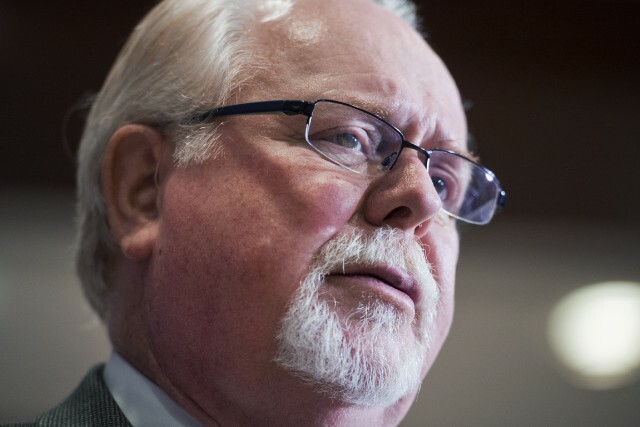 Rep. Ron Barber of Arizona has proposed a competing mental health bill. At a hotel ballroom in the nation's capital, Murphy stands in front of more than 1,000 people for the keynote address of the annual conference of the National Alliance on Mental Illness, the largest nonprofit mental health advocacy group. It's early September, and Murphy hopes to ignite these advocates to get their lawmakers to lend their support in advance of the midterm elections. If there are two bills, why can't they just work together and hammer out an agreement? 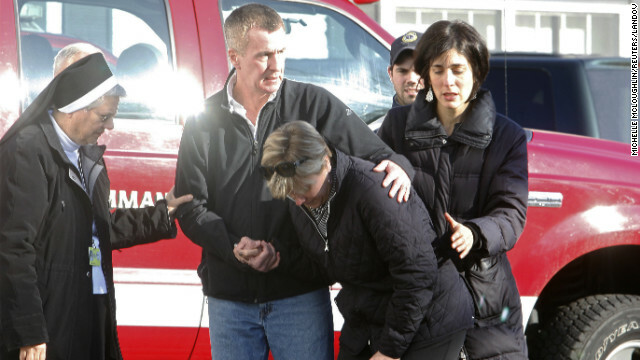 Barber was a key staffer for Giffords and was among the 13 wounded in the attack that nearly killed her. He knows first-hand the horrific effects of untreated mental illness. Barber assumed Giffords' seat in June 2012. His bill avoids the controversial treatment provisions of Murphy's, instead focusing on creating a White House Office of Mental Health Policy, continuing to support the funding of SAMHSA and other initiatives. But Murphy won't budge. He believes his bill is too critical in meeting the needs of the seriously mentally ill: "Why would I want to compromise when you hear these stories over and over?" Murphy looks out over the crowd. He's met many of them over the past two years as he's traveled the country or hosted congressional hearings. He immediately sets the tone. "I'm not interested in just passing a bill. I'm interested in making a fundamental change to America's abuse of the mentally ill," he says to raucous applause. He speaks for 55 minutes, stepping the audience through the changes he has proposed and why he believes so adamantly about the most drastic portions of his bill. His speech is interrupted by applause 30 times. He urges the crowd to tell their representatives to support the bill. "You are an army of soldiers with the biggest hearts and greatest love that is out there," Murphy says. "There'll be people out there who fire upon you slings and arrows of lies and stigmas and deceit and mistrust." When those people attack, Murphy says to stand strong. "We are in this together." A makeshift memorial stands outside a home in Newtown on the one-year anniversary of the shootings. A woman trembles: "My daughter Sarah died by suicide on July 16." Says one man: "My brother got better treatment in 1957 than he would today." On and on, the stories keep coming from people gathered in the Rayburn Office Building to talk with Murphy. Sons, daughters, brothers, sisters, husbands, wives. They're locked away in prisons; they're homeless; they're untreated; they're dead. These families hail from California, Kentucky, New York, Oklahoma, Ohio and Pennsylvania. It doesn't matter where they're from: their stories are the same -- a mental health system laden with hurdles and bureaucracy that makes it difficult to get proper care. Murphy agreed to meet with families in advance of his keynote speech at the NAMI conference. It was supposed to be a small gathering, but word spread among families, and the numbers swelled. "No one came in here saying what party they're in," Murphy tells the group. "I know that mental illness doesn't discriminate by party, by race, by age, by income." The congressman listens to their stories and engages with each on a personal level. "I want to hear from you," he tells them. Dressed in a navy suit, he stands in front and points around the room to individuals who recite their travails. "Every time you think your heart can't take any more," Murphy says later, "you hear more." Rich Mandich and his wife, Joyce, sit in the front row. 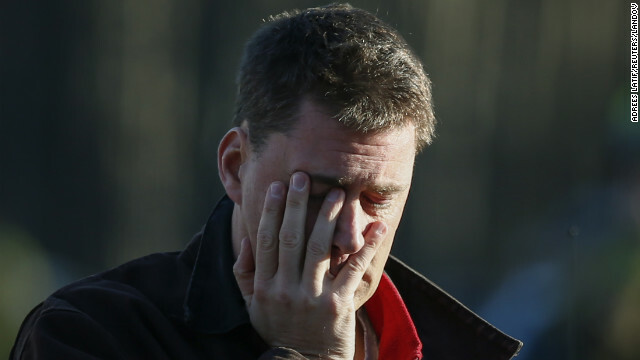 Like a shaken Coke bottle, Rich is about to burst, his emotions pent up for three years. "I want to tell you about my son, Steven," he tells Murphy. His son was 28 and suffered from schizophrenia. Police in Bedford, Ohio, knew him well. They'd responded to the home dozens of times during his meltdowns over the years. Shortly before 6 p.m. on November 26, 2011, Steven called 911 to say his father had his medications. "They laughed at him," Mandich says. "They thought it was funny." His wife moans, her body shakes. Police came to the home. Mandich says he tried to intervene, but was Tasered and dragged out of the home by officers. His son had a knife in his hands and was Tasered multiple times, before being shot to death in his bedroom. Police said he lunged at them with a knife. The family eventually filed suit against those involved. It was settled out of court for an undisclosed amount. Mandich had always been his son's protector, but "that day, I couldn't save him because they got in the way." He breaks down, years of bottled-up pain welling over. Murphy takes off his glasses and wipes his eyes. "He had rights and you had rights," Murphy tells the father. "He had a right to go and live a full life." "He was a valuable person to us," Mandich says. "This kid had a kind heart." The two agree that Steven Mandich deserved better treatment than being gunned down in his room. It is an important acknowledgment for a family still grieving -- to hear someone in power say that their son mattered. When the session ends, Murphy strolls outside around the nation's Capitol, unable to shake the power of the Mandiches' story. "They lost their loved one long ago," he says, "but they've never lost their hope that something can change." The congressman is energized. In his view, the very least he can do is maintain that hope -- that changing the system is worth the fight.